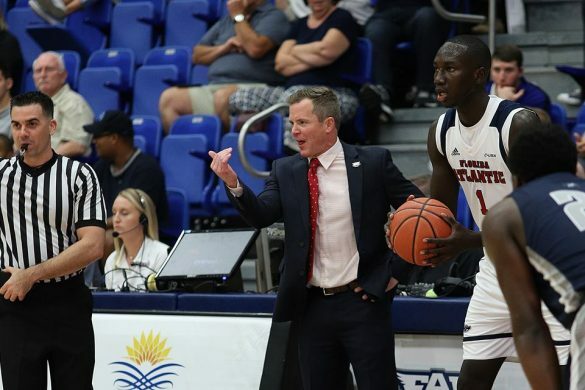 BOCA RATON – The question came late in FAU coach Charlie Partridge’s weekly 15-minute conversation with the media. The answer was as pointed as the query. “Do you feel like your job’s secure?” a reporter asked. Partridge is under contract through the 2018 season. 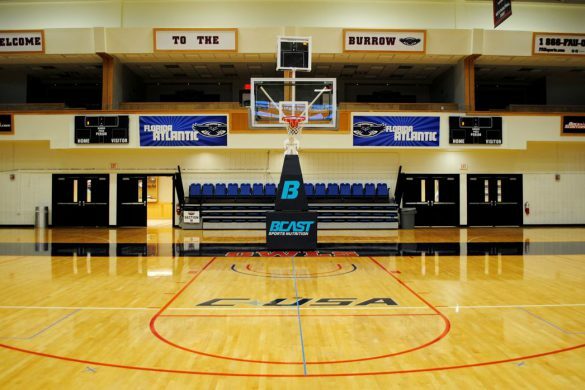 Buying him out would cost the cash-strapped athletic department more than $1 million. 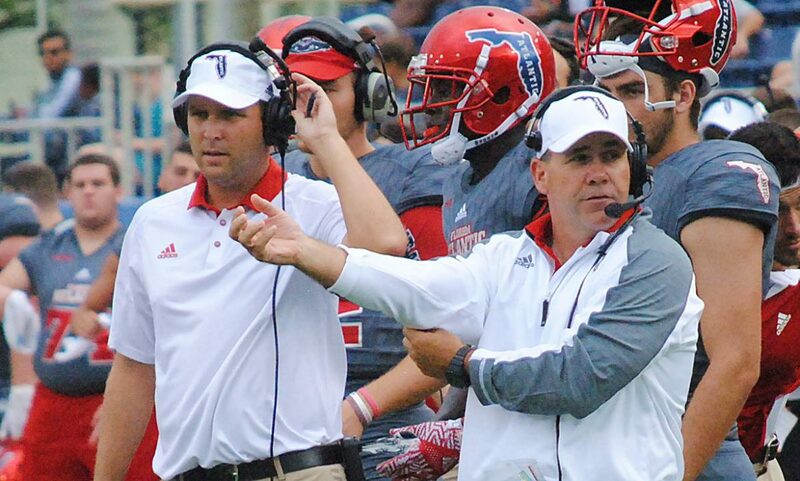 The Owls’ current seven-game losing streak has many FAU fans hoping Partridge is misjudging the situation. 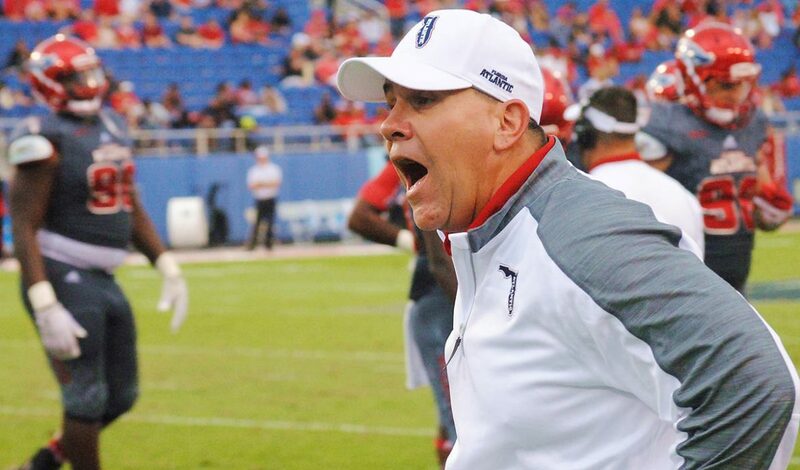 Following Saturday’s 52-3 loss to Western Kentucky – a game in which the Owls looked inept on offense, defense and special teams – fans took to social media calling for Partridge’s removal. When pressed on the question, Partridge steered his answer to Saturday’s upcoming game. “I’m focused on Rice, getting our team ready for Rice,” he said. 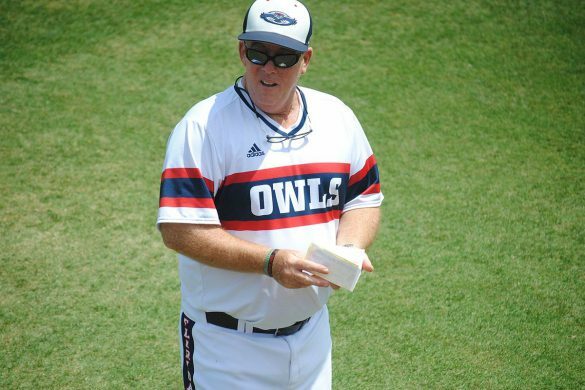 Focusing on Rice provides a more satisfying alternative to focusing on the current state of the Owls’ program. 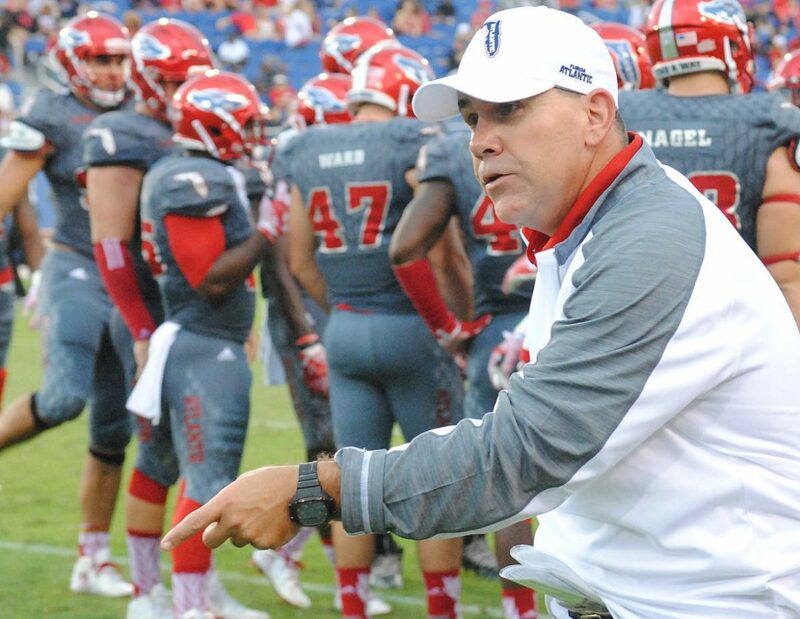 In his third year as FAU’s coach, Partridge holds a 7-25 career record. 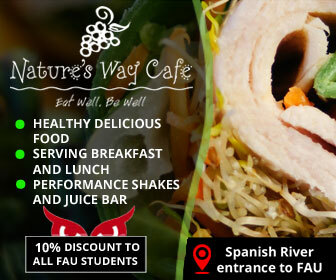 FAU ranks No. 120 out of 128 FBS teams in total defense. Rice is No. 128. 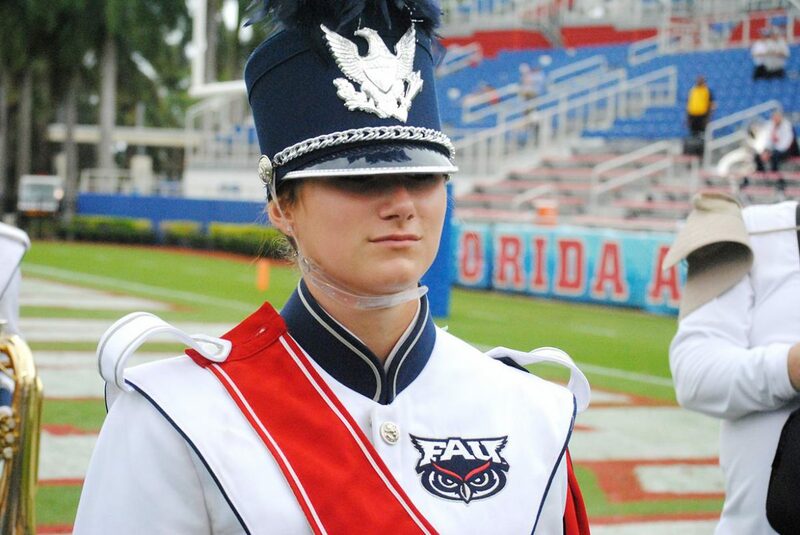 FAU ranks No. 119 in total offense. Rice is only 18 spots better. Every week Partridge says the Owls re-evaluate starters on both sides of the ball. 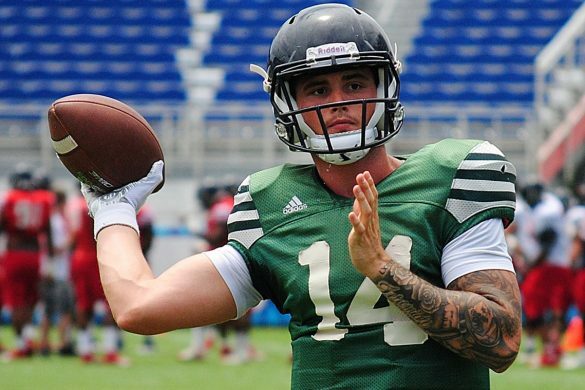 In recent weeks Partridge started inserting backup quarterback Daniel Parr, a redshirt freshman who many believe is the Owls’ quarterback of the future, into the game for the third series, and then again in the second half. Two days after starting quarterback Jason Driskel threw for 52 yards (Parr threw for 25), Partridge appeared more open than in previous weeks to giving Parr more playing time. “That position, we’ll evaluate through the course of this week like we do all of our others and decide toward the end of the week if we’re going to make a change – whether it’s playing time or whatever it may be,” he said. Whichever quarterback starts, he will do so behind a battered offensive line that can’t seem to catch a break. Starting its eighth offensive line in eight games, the Owls lost first-time starting guard Jack Breshears to injury against WKU. Partridge labeled Breshars “questionable” for Saturday. As for starting senior right tackle Kelly Parfitt, who missed the better part of four games, then re-injured his knee two games ago in a loss to Marshall, the outlook appears even more bleak. 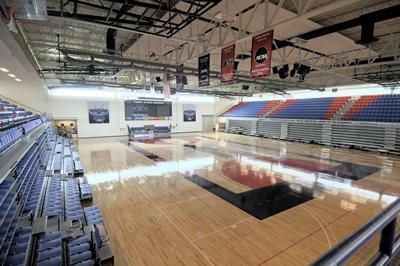 UPDATE: FAU officially announced the selection of HKS Architects as the firm that will design the new Schmidt Athletic Complex. 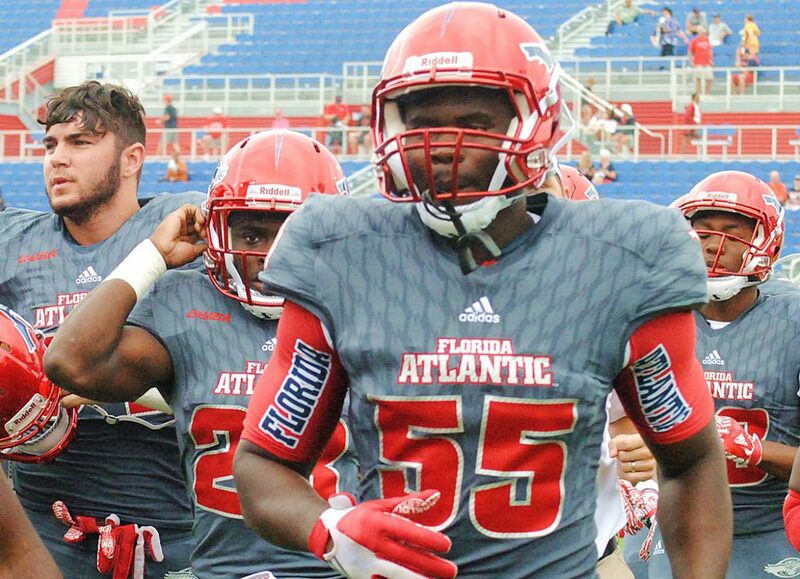 BOCA RATON – FAU could know the architect of the $50 million Schmidt Athletic Complex project as early as Monday and intends to hold a ceremonial groundbreaking prior to the start of the final football recruiting rush. On Thursday the committee charged with recommending an architect to FAU president John Kelly elected to go with HKS Architects. Kelly does not have to accept the recommendation, but in these situations the president generally does. HKS Architects, which also designed FAU’s football stadium, was one of four firms that made final presentations to the committee on Thursday. The first phase of the Schmidt complex, expected to cost about $30 million and cover 96,000 square feet, will include football offices, a weight room, a sports medicine center and an academic support center. It will not include the planned indoor football practice facility, which is scheduled for Phase II. 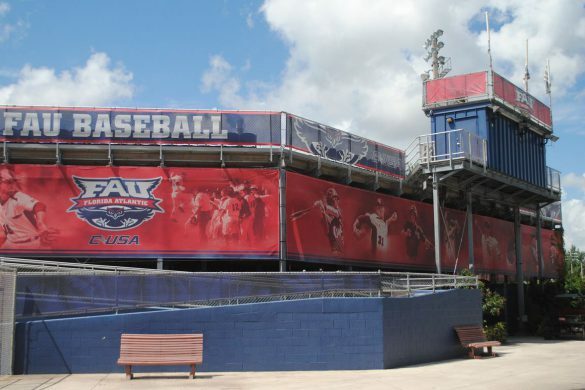 FAU will also upgrade the stadium’s home football locker room, allowing it to be utilized as the full time locker room. 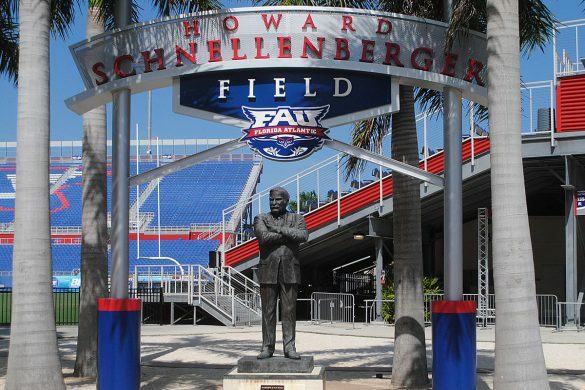 FAU currently operates out of the locker room and football offices in the Oxley Center, relocating to Howard Schnellenberger Field for game days. The current stadium locker room only has room for about 80 players. The upgrade will make room for about 120. 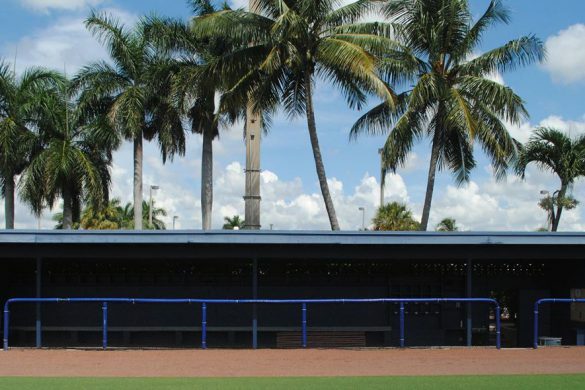 The Schmidt complex will be located on the lawn west of Howard Schnellenberger Field. 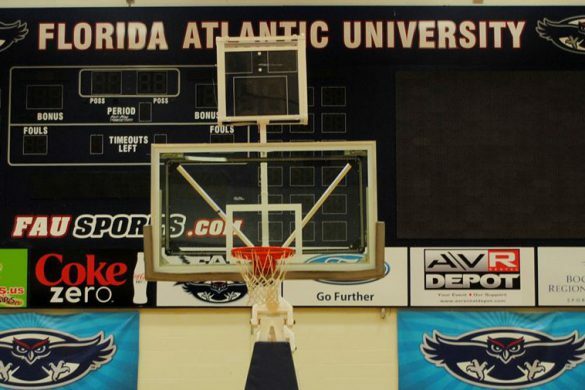 FAU first announced its intention to build the new athletic facility in December of 2014, beginning with a $16 million gift from the Schmidt Foundation. 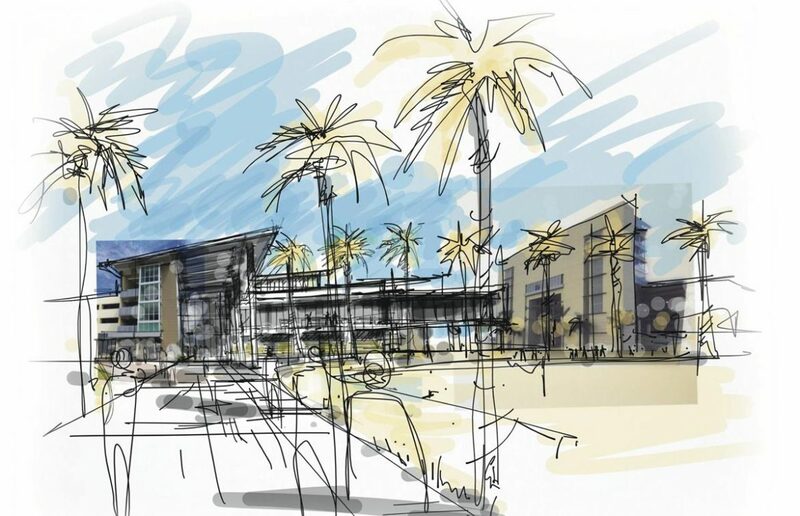 Once the architect is named the university will still need to complete some procedural tasks before going forward with the ceremonial groundbreaking. 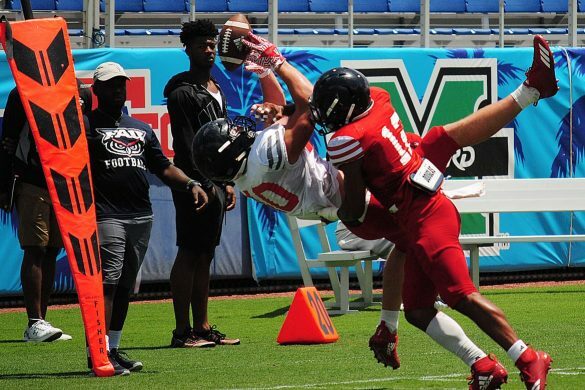 That could happen by the end of November, but will almost certainly occur by early January, which would allow football coaches to tout the project’s progress to recruits in the weeks heading up to the Feb. 1 National Signing Day. 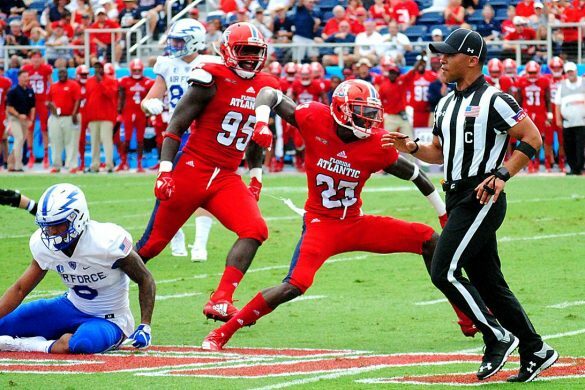 Each Sunday during the football season OwlAccess.com writers Chuck King and Jake Elman dissect the previous day’s FAU football game in a feature we call “Four Down Territory.” Here’s our analysis of FAU’s 52-3 loss to Western Kentucky. 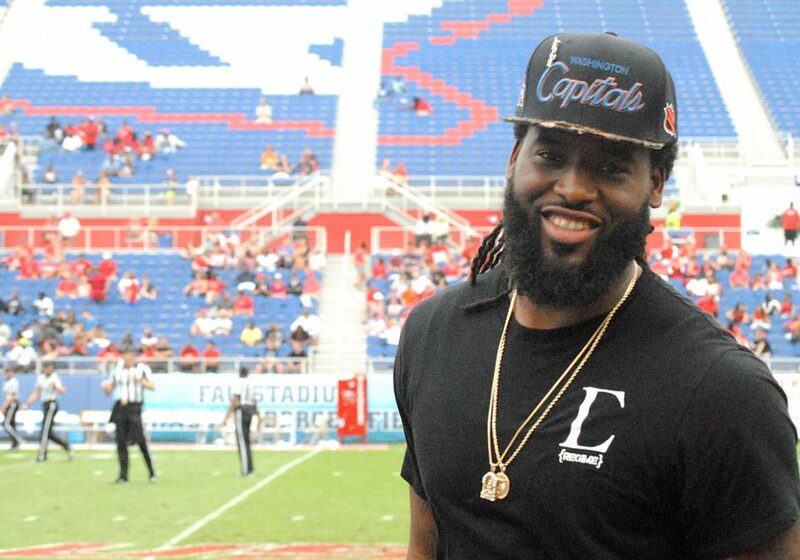 King: Apparently FAU bought a time machine. Why the Owls would want to return to the 2011 game against Western Kentucky is anyone’s guess. That’s the game that opened Howard Schnellenberger Field. FAU lost to a 1-4 WKU team 20-0. The Owls managed only 121 yards of total offense that day. 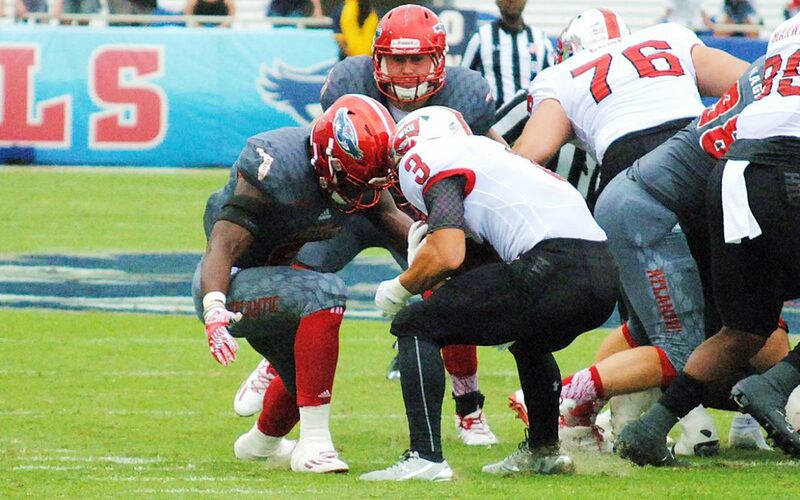 The Owls posted 202 yards on Saturday, with the defense allowing 661. And that was after having two weeks to prepare for WKU. Yes, the Owls’ offensive line is decimated, but that effort on both sides of the ball was humiliating. 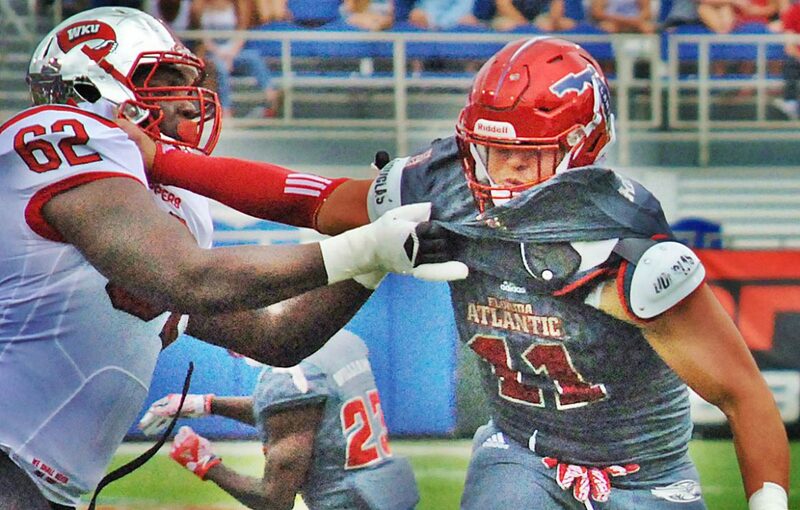 Elman: Not even a bye week and the ‘allure’ of homecoming could fix the broken mentality of the Florida Atlantic Owls. From the time this game started, the Owls played lazily and broken, almost like they just wanted to get things over with so they could enjoy the rest of their Saturday. 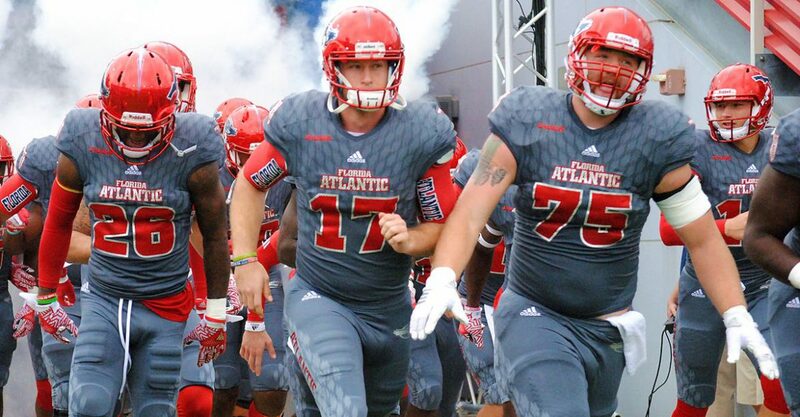 At 1-6, FAU still had a chance to win out, finish .500, and build some momentum going into next year, but the Owls instead played like they were more concerned about which homecoming party was going to be the best that night. Wilson: How did the FAU running game become non-existent. 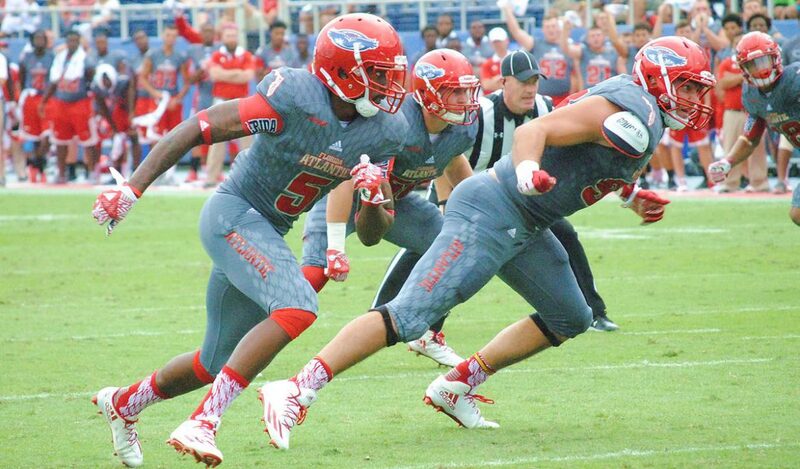 It had been the best part of the FAU offense and they were not able to run against WKU. Buddy Howell and Devin Singletary were both held to under 40 yards with no scores. 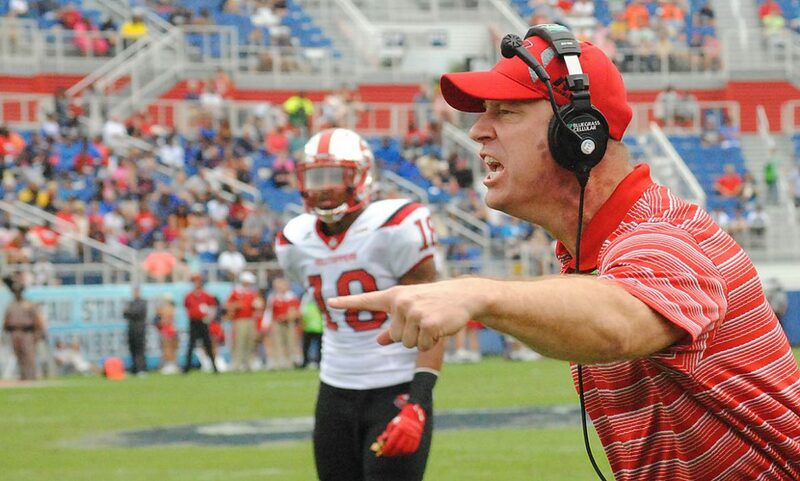 King: How about the job former FAU assistant Jeff Brohm is doing at WKU? The Hilltoppers not only cemented the fact that FAU won’t go bowling, they became bowl eligible themselves. Could they return to Boca in December? And Dale Williams’ offensive line looked pretty strong, too. 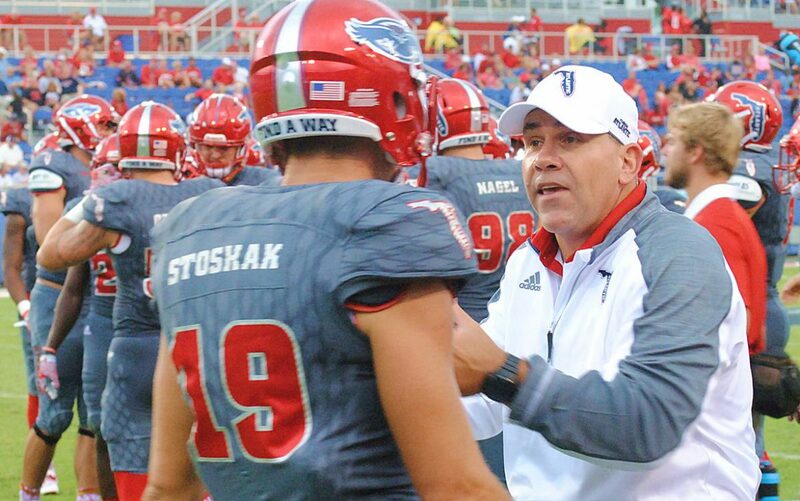 As for FAU, it’s not often a gunner on the punt team appears here, but Jake Stoshak downed a punt at the 1-yard line, then recovered a muff at the 6, leading to the only FAU points. 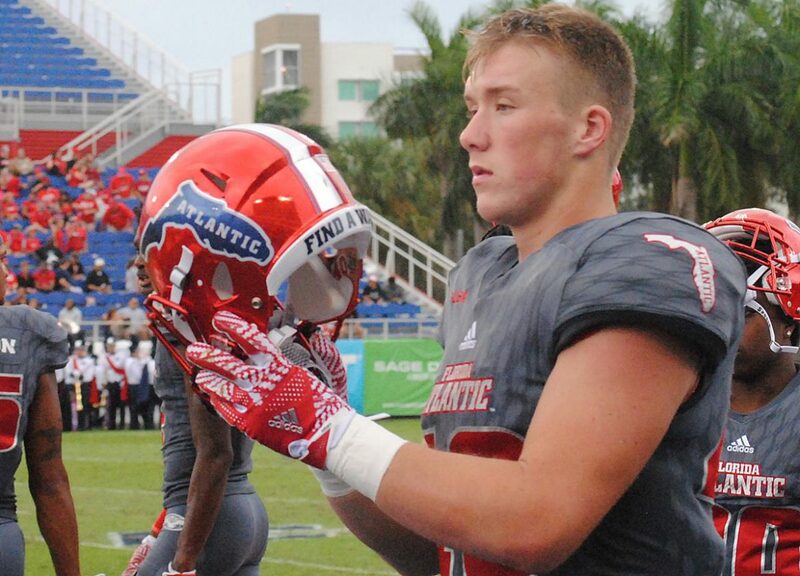 Elman: Take your pick from Western Kentucky (probably quarterback Mike White), but for FAU…maybe Dalton Schomp should get it for setting a program record with 466 punt yards? 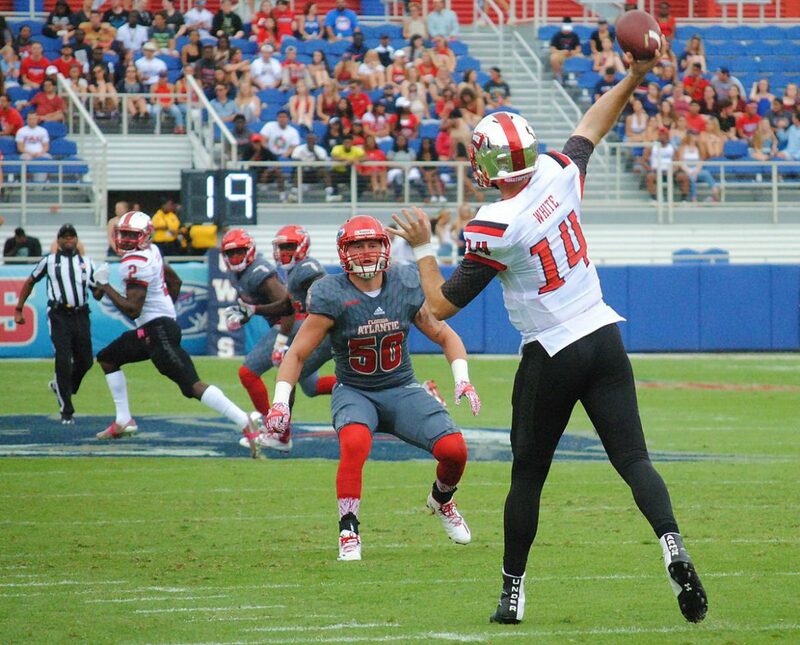 FAU’s failures can’t be blamed on a punter who consistently buried WKU deep in their own territory. If Schomp isn’t the guy, it’s probably the fan asked to kick a 40-yard field goal in rain and wind during a timeout promotion. Get this guy a spot on the team when Greg Joseph and Dalton Schomp graduate! Wilson: Hunter Snyder was the player of the game for sure. He was able to get a sack against the dominant Western Kentucky offense. 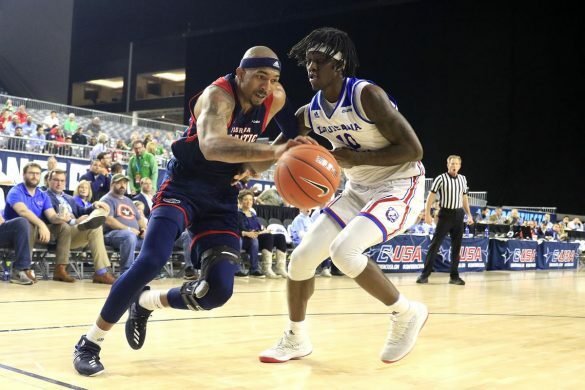 The rest of the FAU team was not able to perform both offensively and defensively. Snyder recorded three tackles in what was maybe a worse loss than the one earlier this season to Kansas St.
King: Basically, any defensive call FAU made on third down. It started on the opening drive of the game, when WKU turned a third-and-11 into a 76-yard touchdown and continued throughout the afternoon. 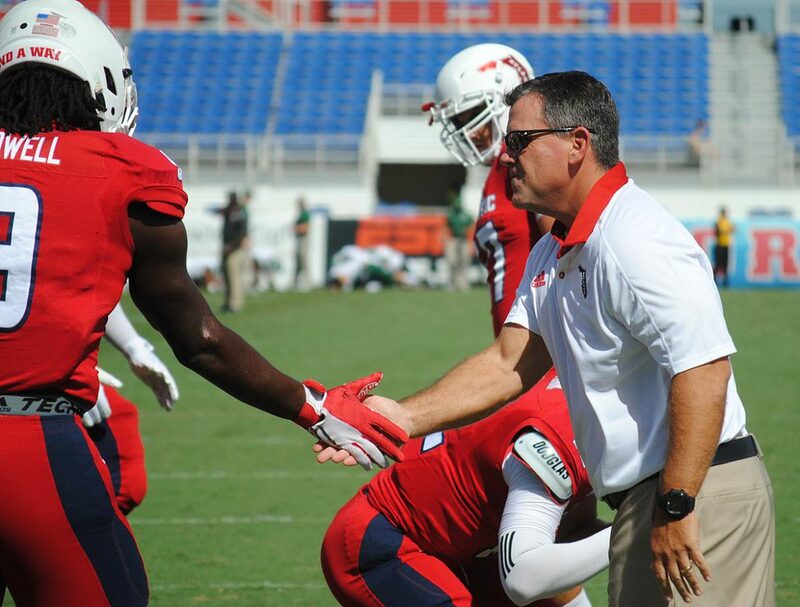 During the bye week FAU placed an emphasis on third down defense. The result? WKU converted on 10 of 16 attempts, often for touchdowns. Inexplicable. Elman: The lack of touches given to Howell in a must-win game. Kalib Woods and Howell have been the Owls’ best offensive players and two of the few consistent pieces on this team despite starting eight different offensive line combinations in eight games. Asked about this in the post game, Charlie Partridge didn’t really give a clear answer and almost seemed to attribute it to the offensive line…but Howell has had a career season and one of the best campaigns in the conference regardless of who is blocking for him. 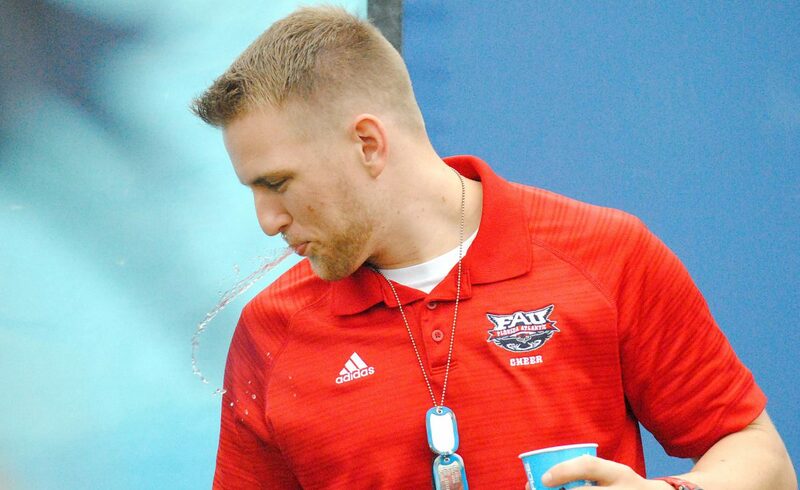 Wilson: A controversial call was when FAU didn’t elect to give quarterback Daniel Parr more time at the end of the game. With the season now basically over, the Owls should have been looking more at Parr, especially towards the end of the game. King: Not sure what FAU offensive coaches are saying to players at halftime, but they may want to consider another option: silence. 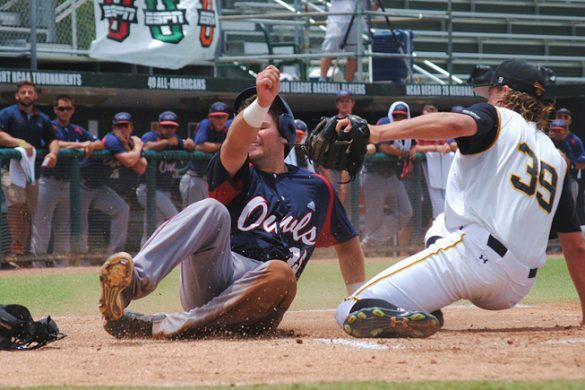 The Owls failed to score a point in the second half for the second consecutive game. 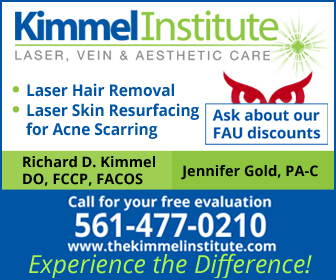 FAU has scored only 19 points in the fourth quarter all season and 54 points in the second half. To put that in perspective, FAU has allowed a total of 64 points to its opponents in third quarters this year – it’s best defensive quarter. Elman: You never like to speculate about job security, but with this team 1-7 and in a total free fall, players almost certainly have to be worried about the futures of some men they look to as father figures and mentors – as they should. What is bothersome is that if players are indeed worried or anxious, they’re not playing with the expected intensity that would allow their mentors to keep their spots. These kids are still college kids, yes, and they’re angry that they’re 1-7, but what’s the point of rolling over and just taking each blow they get? Wilson: FAU’s postseason hopes are now officially extinguished. The Owls will not be making a bowl and have three losses in C-USA. 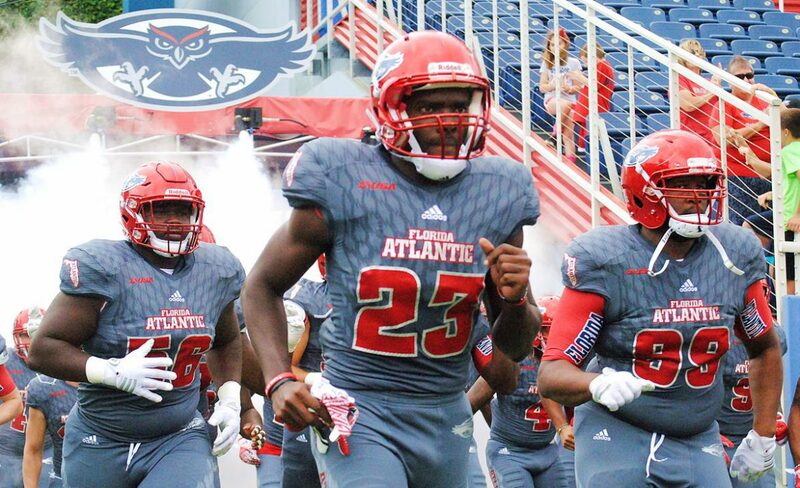 FAU needs to look and see what they can do for next year. They Owls can’t get much younger, but maybe it is time to look at some of the younger players. 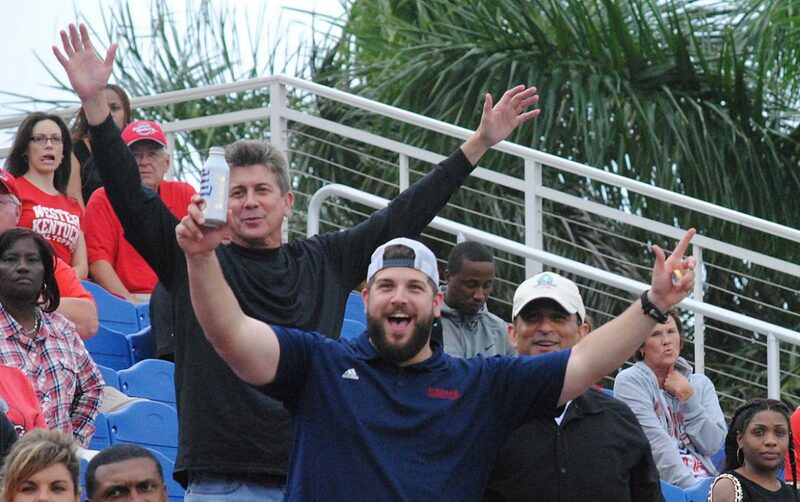 BOCA RATON — If any of the school’s literature professors were in attendance for FAU’s homecoming game, they’d be in love with the educational presentation the Owls gave their fans. 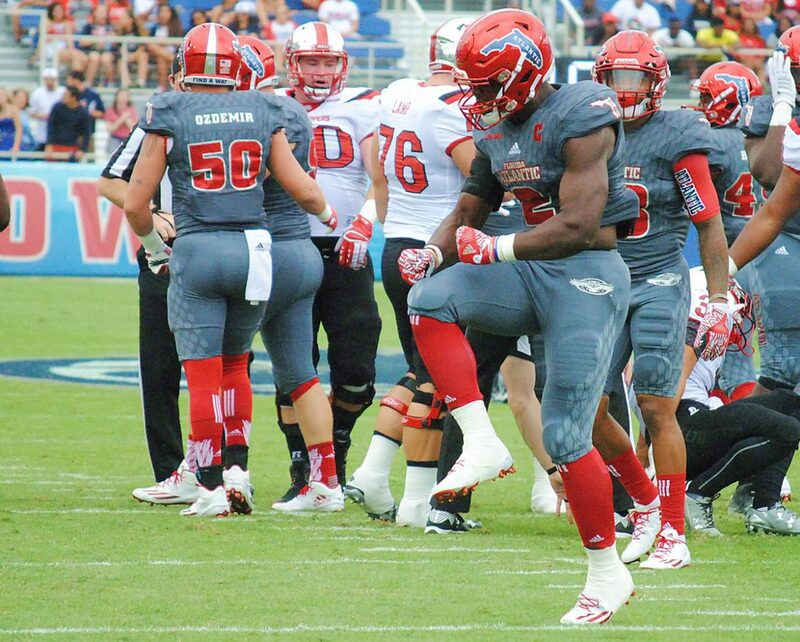 After all, the gray mood established by the sky above and the gray uniforms the Owls debuted on Saturday turned out to be a perfect motif for what turned out to be FAU’s seventh straight loss, a 52-3 blowout by Western Kentucky. 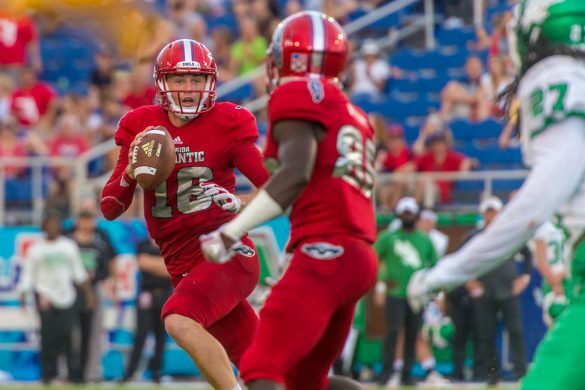 The Hilltoppers – led by a huge game from quarterback Mike White – officially closed the coffin on any chances of FAU turning their season around and regaining any pride that was lost in these past few weeks. With the loss, the Owls are now officially eliminated from bowl contention and will finish with their third straight sub .500 season. 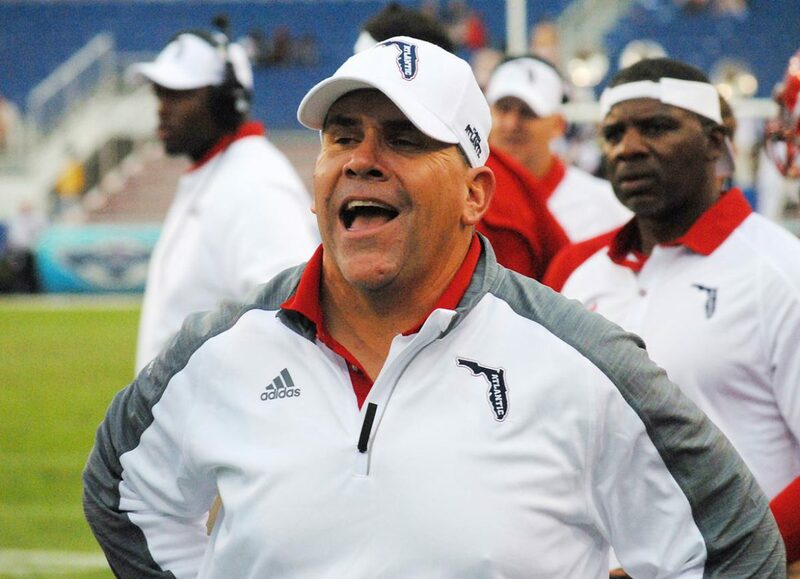 FAU has now had losing seasons in six of the past seven years, with the one exception being the 2013 campaign that saw Brian Wright finish as interim coach after the dismissal of Carl Pelini. In his first three seasons, Charlie Partridge has failed to deliver on the one thing fans and the athletic department thought was a near-guarantee: a return to winning. As the markings on the new uniforms that resembled tread marks showed, the program has instead officially become one that is easily run over. 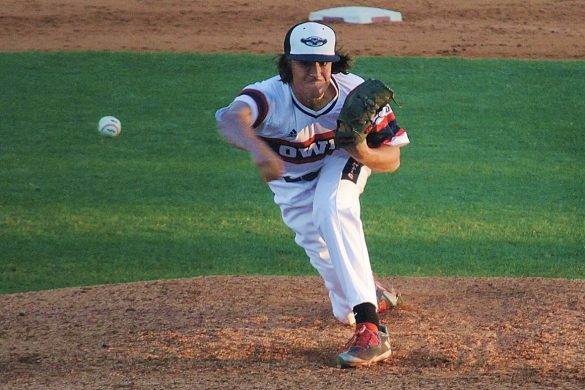 The problem for these Owls, however, is that those big wins rarely happen. 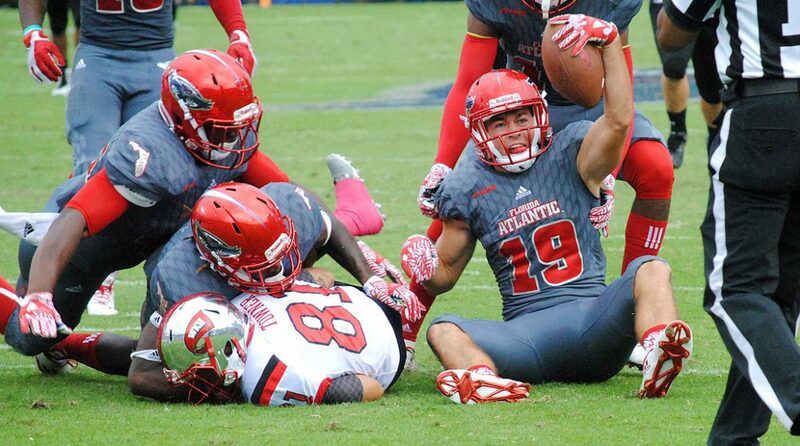 FAU, which scored its three points in the first half during which it couldn’t even muster 100 yards of total offense, continued a trend of looking broken and mentally defeated on Saturday afternoon. 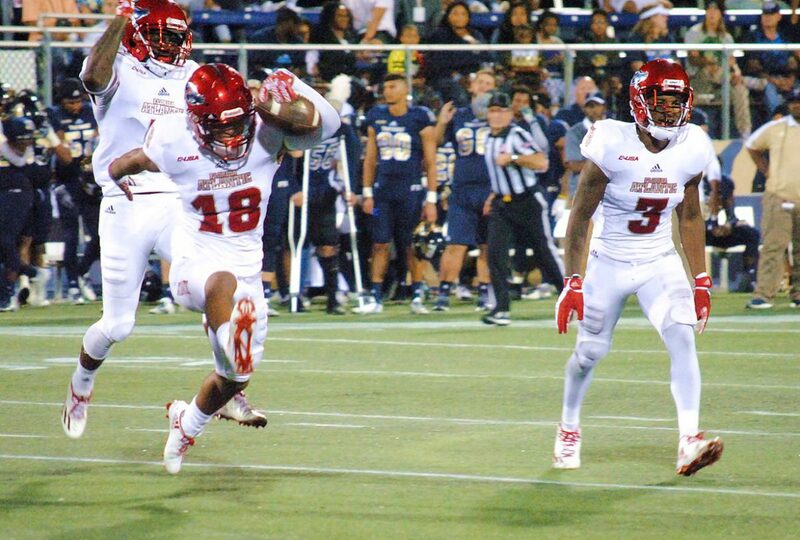 The Hilltoppers kicked things off with a bang, scoring on the third play as senior wide receiver Nicholas Norris beat Andrew Soroh in coverage for a 76-yard touchdown. In the first half alone, Norris had more yards on his own (111) than the Owls offense as an entire unit (84). White, who has had a breakout 2016 campaign for the Hilltoppers and entered Saturday with a 20-5 TD-INT ratio, threw for 260 yards and three scores in the first half. The Ft. Lauderdale product finished with 307 yards and a 61% completion percentage before being lifted in the fourth quarter. The ugliest part of that horrific first half was that Western Kentucky’s shortest touchdown was a 54-yard White pass to Lucky Jackson; FAU’s best two drives in that half, when the total yards are added together, comes out to be 55. For a team who has had success hanging with better teams in the first half for nearly all of their games this year, the lackluster showing in the first 30 minutes spoke volumes about where the Owls stand in week nine. With Halloween just days away, the Owls nearly faced a spooky sight of their own when Trey Hendrickson remained on the ground following a second half play. Hendrickson, who recorded his sixth sack of the year in the loss, returned in the fourth quarter and did not seem limited by the injury. 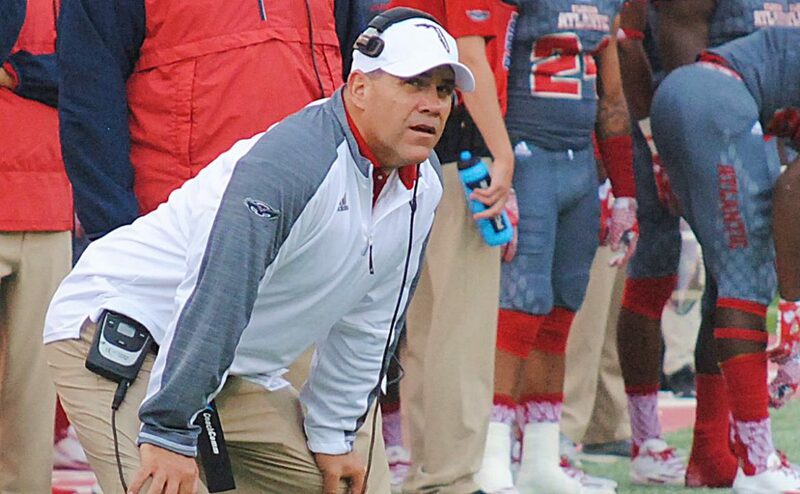 FAU managed only 202 yards of offense against the Hilltoppers. Alternating between Jason Driskel and Daniel Parr at quarterback did little to spark the offense. 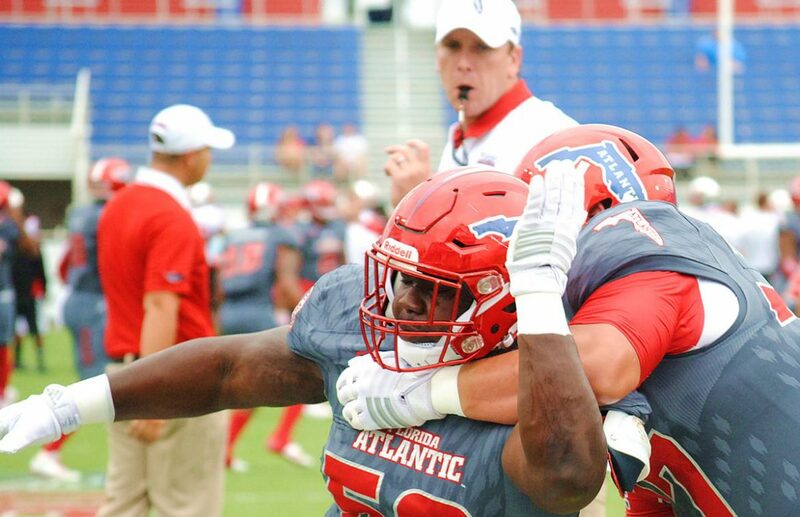 Just when it looked like the Owls’ defense was improving with two straight games of less than 30 points allowed, FAU surrendered nearly 700 yards of offense. Just when it looked like FAU had figured out some of their offensive woes when it came to consistency, the team went one-for-13 on third downs. Say what you want about how “it’s not how you start, but how you finish” but the way FAU’s defense started said everything anyone needed to know about this game. On a third-and-11, White found Norris for 75 yards and the Hilltoppers immediately took a 7-0 lead in Boca before fans, what few there would be, even found their seats. 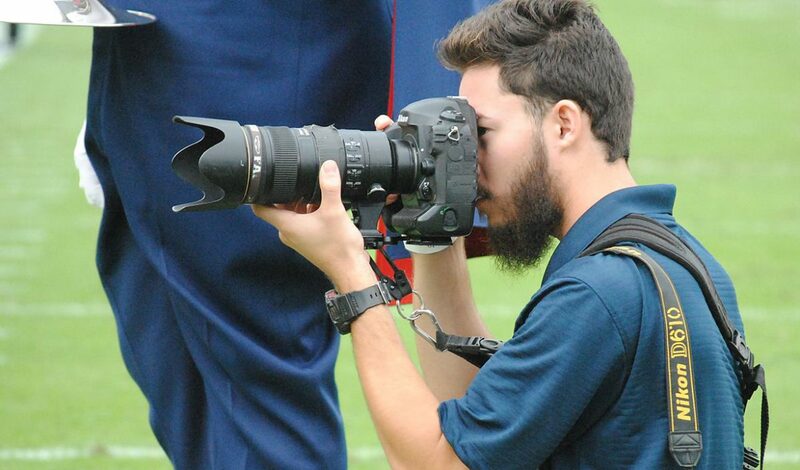 With the season officially at the point of no salvation, Partridge and offensive coordinator Travis Trickett need to decide if a change at the quarterback position – if only to give Daniel Parr the bulk of the snaps as opposed to him occasionally relieving Driskel for a drive or two – should be in the works for the final four games. Driskel hasn’t had a bad year by any means, but at 1-7 and playing for pride and development, would it really hurt to give Parr the start against Rice or UTEP? Clearly, the coaches see something in Parr where they’re alright with giving him drives in the first half, so let’s get a full game out of the redshirt freshman to see what he can do for 60 minutes. In the words of NBC football commentator Cris Collinsworth, “you look back and ask what happened on third down?” Seriously, what went wrong with the Owls on third and long, especially on the defensive end? 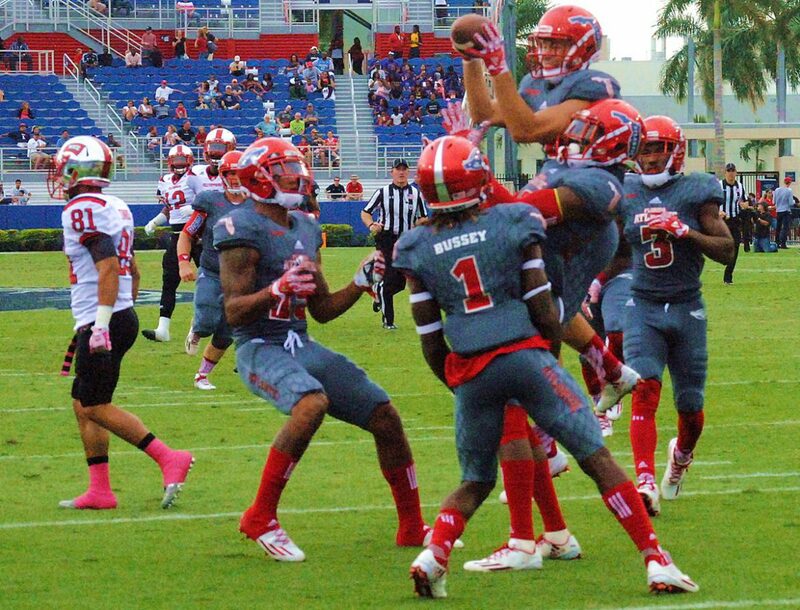 On that first drive, FAU already had some momentum and had the Hilltoppers facing a third-and-11…and proceeded to give up a 75-yard bomb for a score. Next drive, Western Kentucky has a third-and-eight on their hands and White finds Norris for a first down. Next drive? White finds Lucky Jackson on a third-and-10 and a few plays later, the two pair up again for a 54-yard strike. 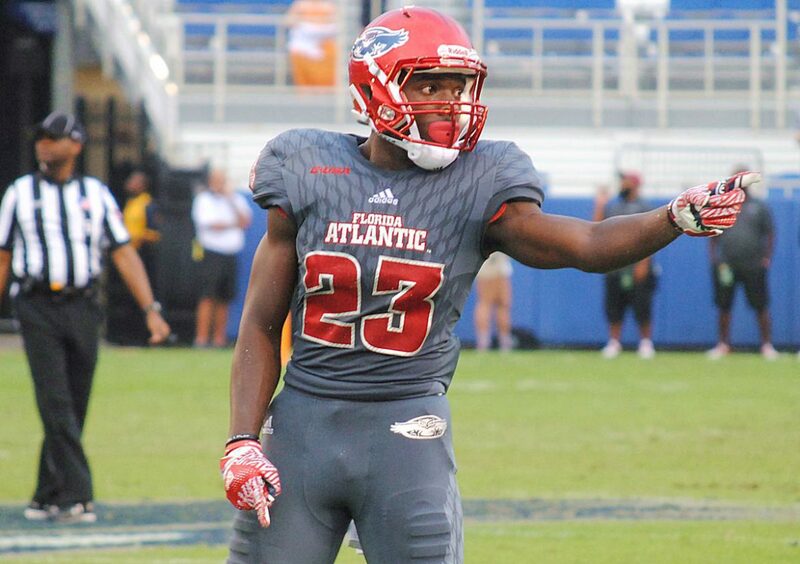 In the start of the season, FAU had a problem closing out the first half but now, the problem appears to be third downs. WKU converted 10-of-16 third down opportunities on the afternoon. Buddy Howell averaged 16.8 carries in the first three games, but only had his number called nine times on Saturday. Even if the offensive line is as battered as it is, why limit the star running back and arguably your best offensive player in a game that technically is a must-win? With the offensive line battered, nothing was going to come easily, but didn’t Howell deserve the ball? 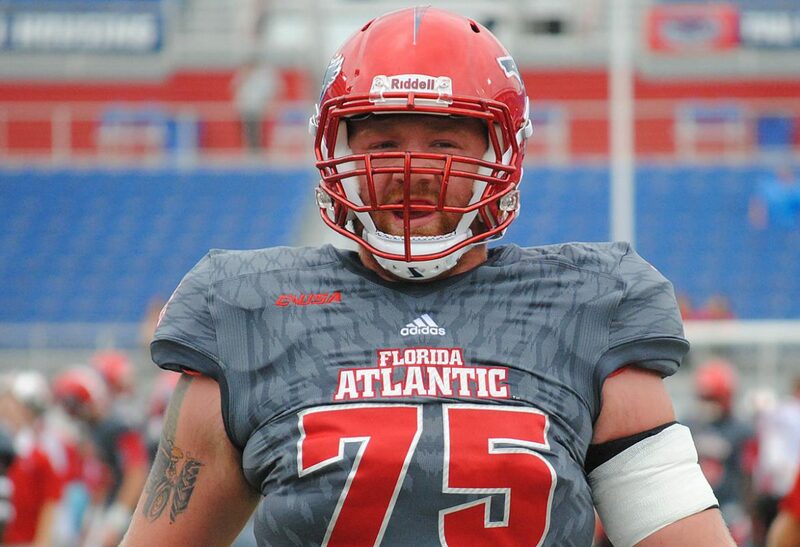 Injuries keep adding up for FAU as offensive lineman Jack Breshears will be evaluated by doctors following the blowout loss. 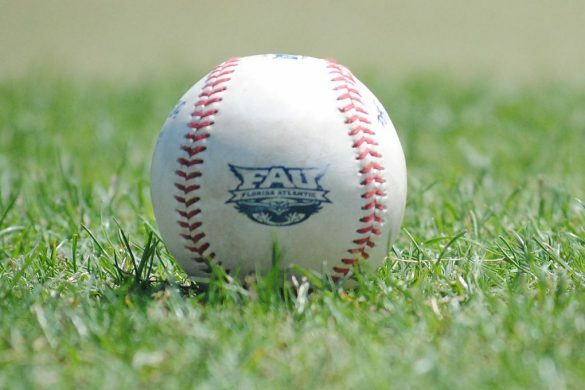 Could the Owls potentially have 12 different starting lineups in all of their 12 games? 1 – Third-down conversion from the Owls on 13 opportunities. 3 – Tackles by safety Jalen Young, who entered the game as the Owls’ leading tackler. Partridge said Young had been battling the stomach flu since Friday night. 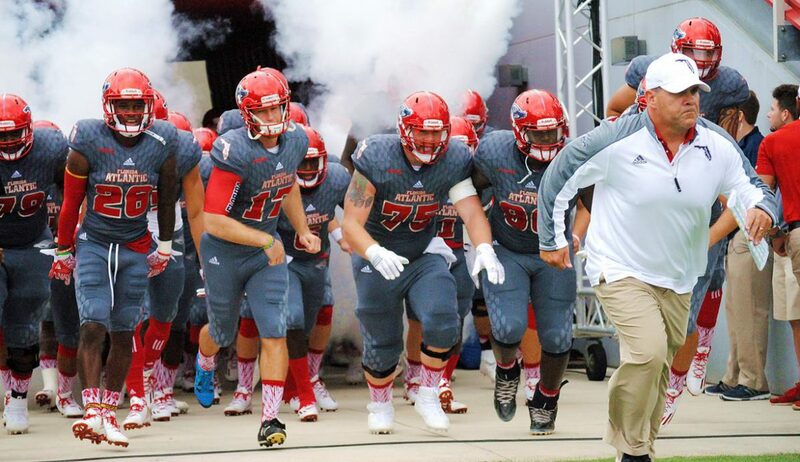 6 – Games the Owls have had where their defense has allowed 30 or more points. 8 – Different offensive line combinations the Owls have used in as many games. A guard, Breshears made his first career start. Matt Weiner lined up next to him at tackle. Kelly Parfitt didn’t dress for the game. 19 – Receiving yards from Kalib Woods, only the second time this season he’s had less than 60 yards in a game. 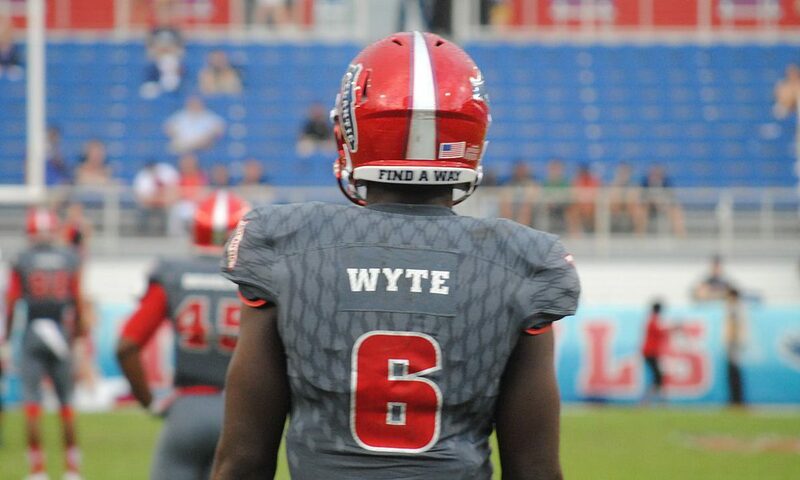 46 – All purpose yards for Kerrith Whyte, most among the Owls. Kick returns accounted for 35 of those yards. 89 – yards by WKU running back Anthony Wales, who missed the first half due to a suspension following an on-field brawl last week. 202 – Total offensive yards by the Owls in the game. 283 – Offensive yards the Hilltoppers had after 16 minutes of play. 466 – Punt yards for Dalton Schomp, a single game program record. 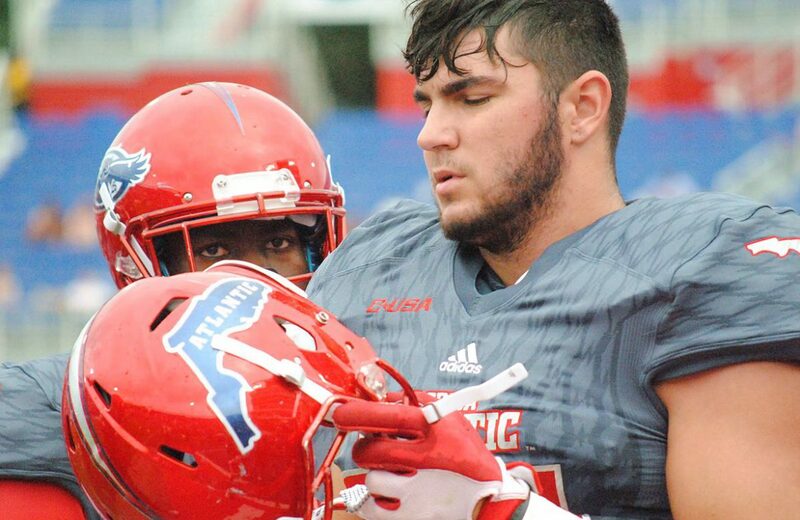 The Owls grab their cowboy hats and horses this week in preparation for a Saturday match-up at Rice, with kickoff scheduled for 3:30 p.m.
BOCA RATON – FAU debuted gray uniforms under gray skies in what would become a dark day against Western Kentucky. 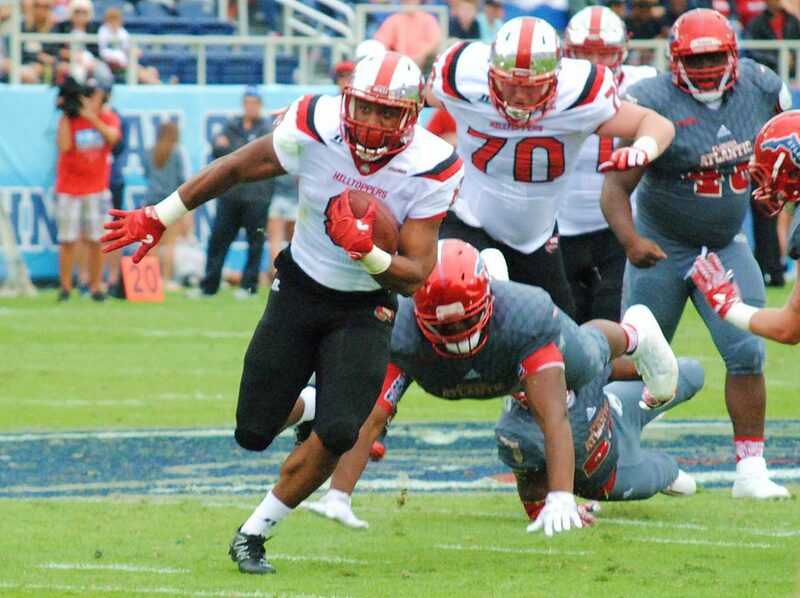 The Hilltoppers handed the Owls their worst loss ever at Howard Schnellenberger Field, dismantling FAU 52-3. 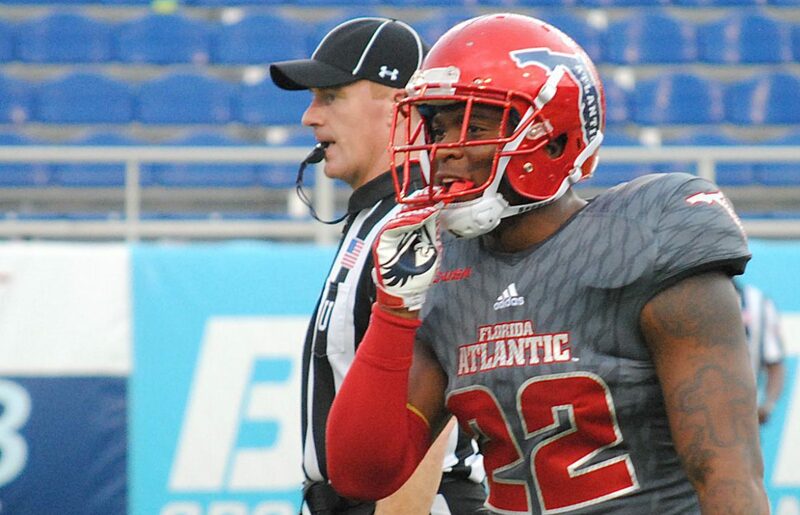 While the game wasn’t petty for FAU fans, some of the images came out nicely. Here’s a massive photo gallery that includes a couple of Jake Stoshak, several of Trey Hendrickson and a tighter look at some of the new faces on the defensive line. 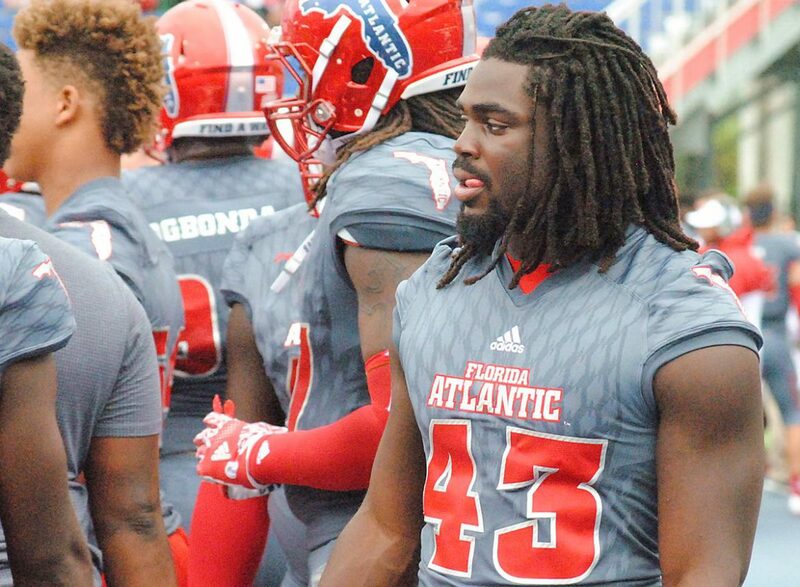 The loss dropped FAU to 1-7 on the year and ensured the Owls won’t be going bowling. FAU still has two more games remaining on the schedule, beginning on Saturday with a trip to Rice. 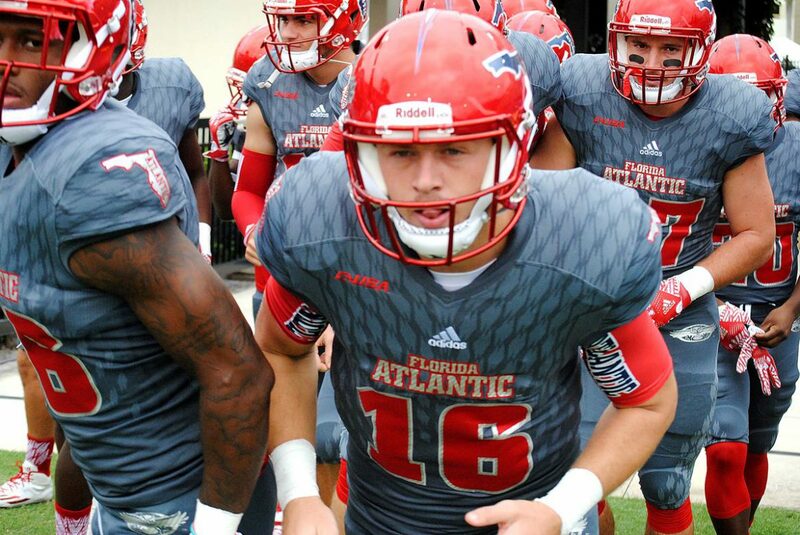 Kickoff from Houston is slated for 3:30 p.m.
FAU rocking the brand new gray unis with red helmets and red numbers. 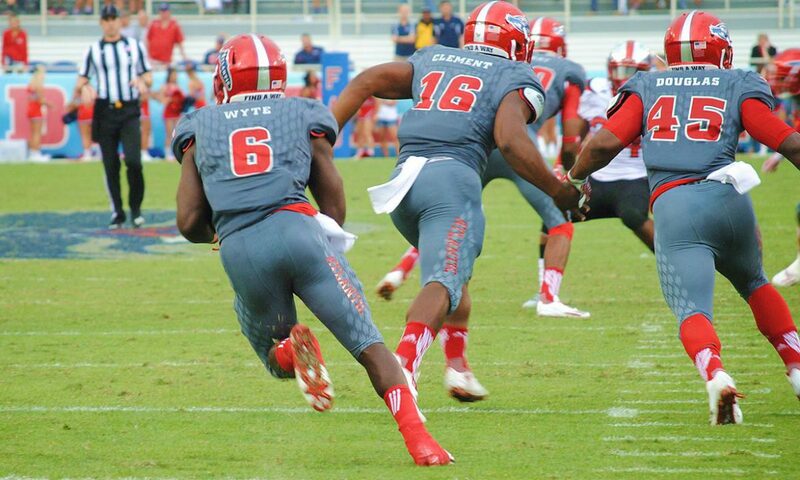 Western Kentucky in white jerseys with black pants; red numbers. 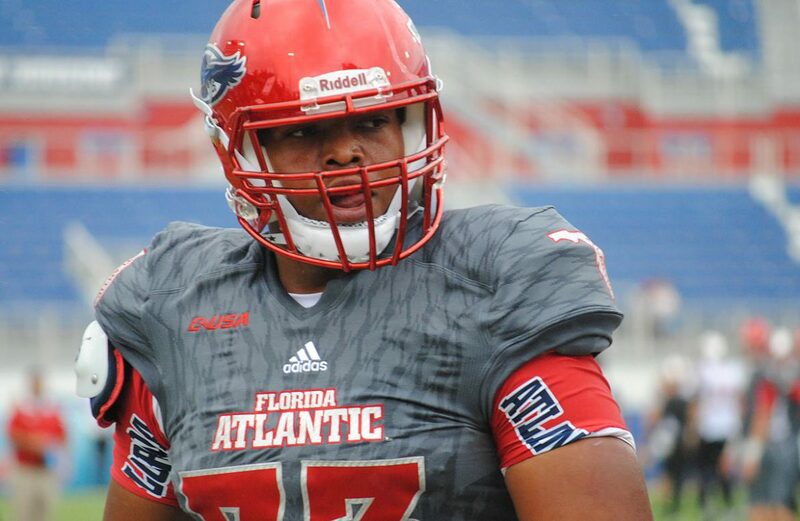 Guard Jakobi Smith dressed for FAU but it looks like Jack Breshears will start. Matt Weiner at tackle. 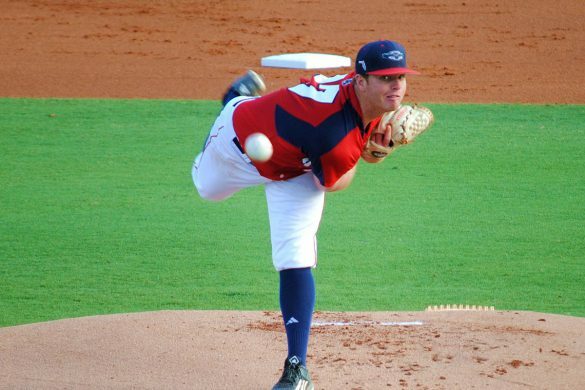 Guy you want to keep an eye out for: Harrison Bryant. We saw him get involved a bit against Marshall and Driskel may look his way today. Happy Homecoming. For those who want to relive the glory days of beer pong and all night study sessions, we’ll tweet out HC king/queen. Alright folks 3 minutes until kickoff. What’s the main thing you think the Owls need to do to win? Send it our way! Third and 11. WKU scores on a 76 yard touchdown pass to Nicholas Norris. 7-0 WKU. 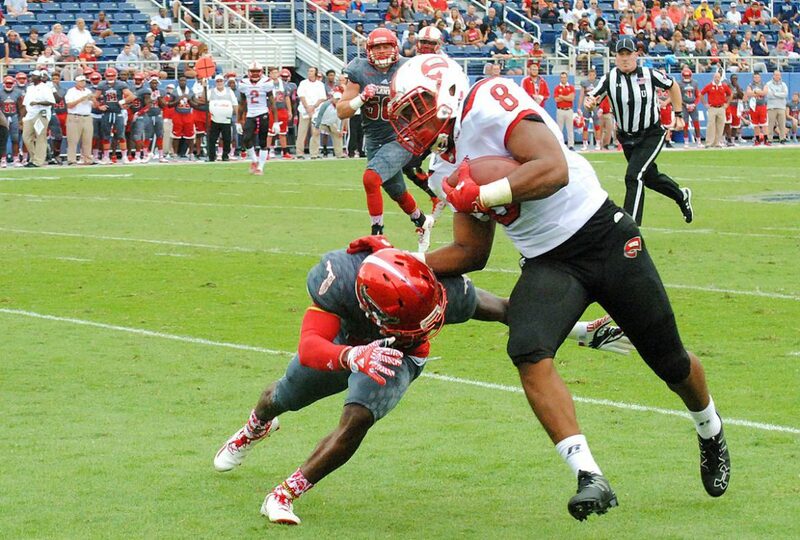 WKU faces 4th and 5 from FAU’s 23 and will kick…into the student section no good! Wide right! 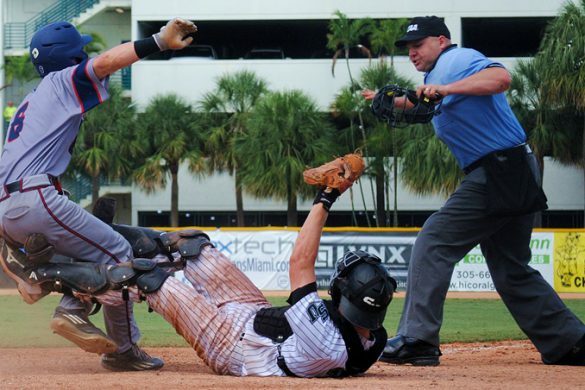 FAU catches a small break. When you watch the running duo of Gregory ‘the artist formerly known as Buddy’ Howell Jr. and Kerrith Whyte, you gotta ask how they’re 1-6. So Harrison Bryant just nearly got decapitated and the refs aren’t throwing a flag. Neat. 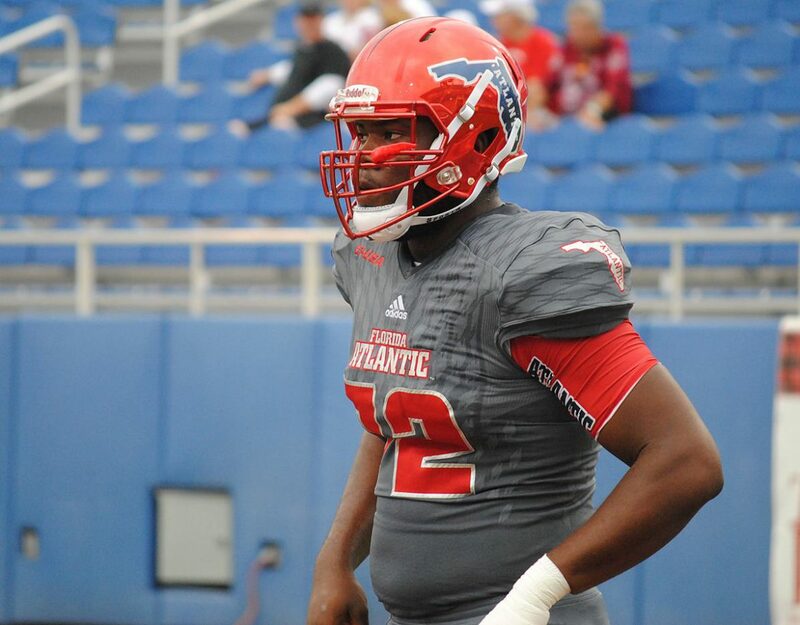 What a time to be an FAU fan or player. Wah wah wah. Lucky Jackson is Lucky and he scores on a 46 yard touchdown pass. 14-0 WKU and that right there was FAU’s season in a nutshell. Truth is WKU is a good team who could realistically finish 9-3 but FAU just looks broken and nonchalant. It’s just awful to watch. It’s 4th and 14 at the 48. The Owls are punting down 21. God. What a catch that would’ve been if he hadn’t gone out of bounds at first. 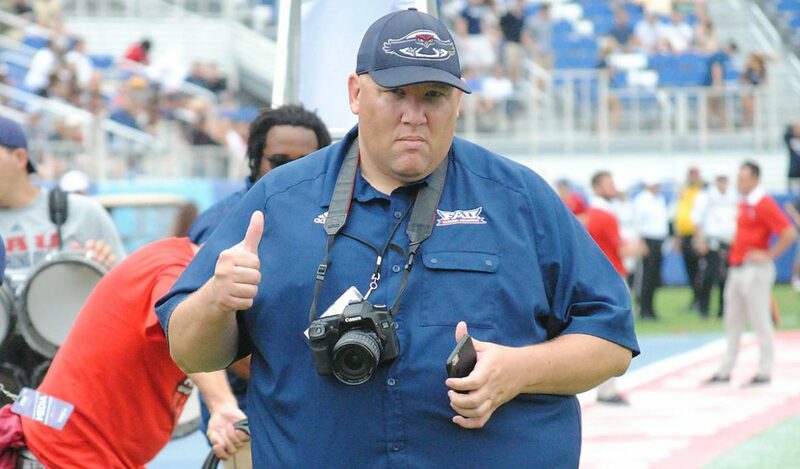 WKU at FAU’s 18 with 2:24 left so..what’s for dinner? #TREYED. 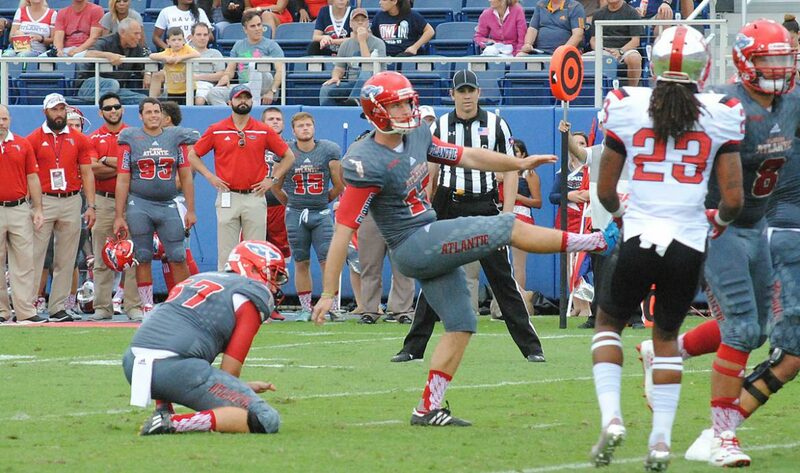 WKU kicks a FG to go up 24-0 on FAU. 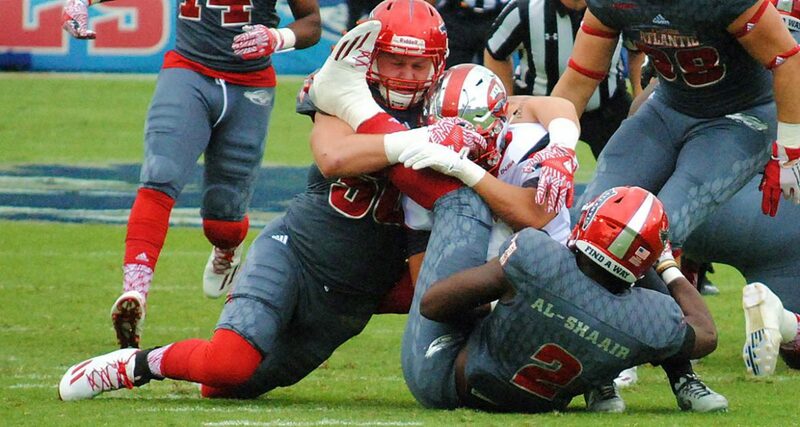 FAU has the ball at WKU’s 9 after a fumble recovery. That’s Jake Stoshak with the recovery. About 20 seconds left to score. Caught by Henry Bussey? Nope. Incomplete. FAU will kick a FG. It’s 24-3 WKU going into halftime. Send us your thoughts on the game. We’re back. Surprising amount of fans still here, though student sections looks to have cleared out. Trey Hendrickson questionable to return with knee injury…sigh. Anthony Wales touchdown. 38-3 WKU and we still have 2:21 left in the third quarter. Welcome to the new low, folks. This dude has to kick a 40 yard field goal in the wind for 10 grand. Can he do it? Nope. He came close, maybe five or six yards short. 45-3. 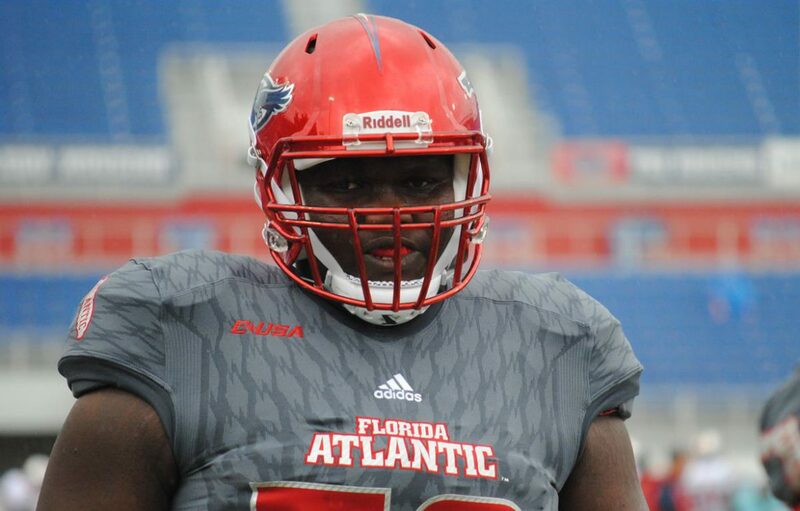 If any of you have a single positive from this game other than the offensive line, let us know.,This indeed is the new low for FAU. Driskel picked off so FAU now has 4:35 to prevent another tea from getting 50 points on them. 52-3. What a disaster and what a destroyed program. Worst home loss in program history. FAU now eliminated from bowl eligibility. Try our FAU Football Trivia Challenge created specially for the FAU vs. WKU game on the right rail of your computer screen. 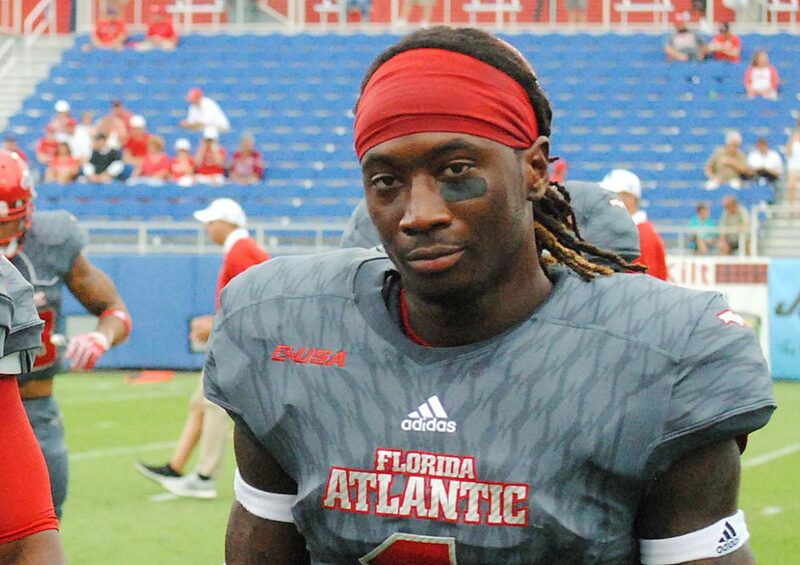 Key for FAU: Run the ball. It won’t be easy. WKU fields an experienced defensive line while the Owls will be starting their eighth offensive line combination in as many weeks. Both Buddy Howell and Devin Singletary are coming off 100-yard games. The more Howell and Singletary are on the field, the fewer opportunities Mike White and the WKU offense will enjoy. Key for WKU: Let the game come to them. The Hilltoppers are the better team, but the Owls have shown they can hang with better competition – at least for a while. 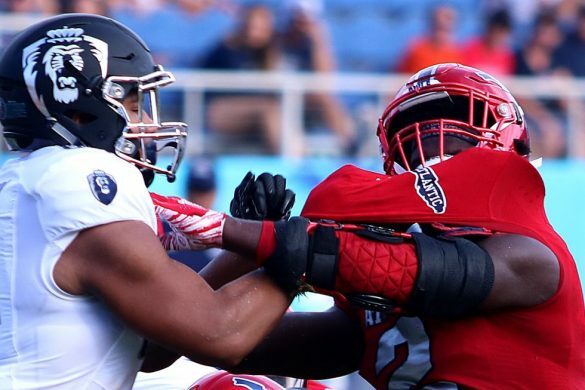 If WKU doesn’t try to force things on offense – and turn the ball over doing so – FAU has a propensity for making the kind of mistakes that let games slide away. 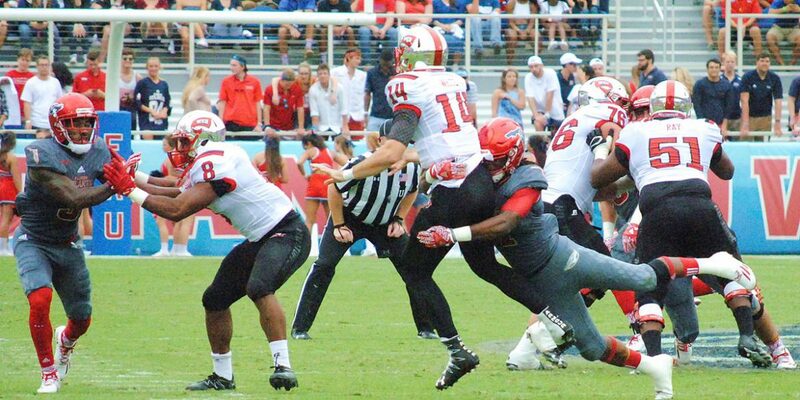 Key Match-up: WKU offensive line vs. FAU defensive line. Our preview for this game focused on the Owls’ defensive backs and their ability to curtail the potent Hilltopper passing game. That effort would be greatly aided by a strong pass rush. WKU has a big, experienced offensive line. Can the Owls front four find a way to pressure White into mistakes? Halftime: Conference USA suspended Western Kentucky RB Anthony Wales for the first half of Saturday’s game following his role in a bench-clearing altercation between WKU and Old Dominion. 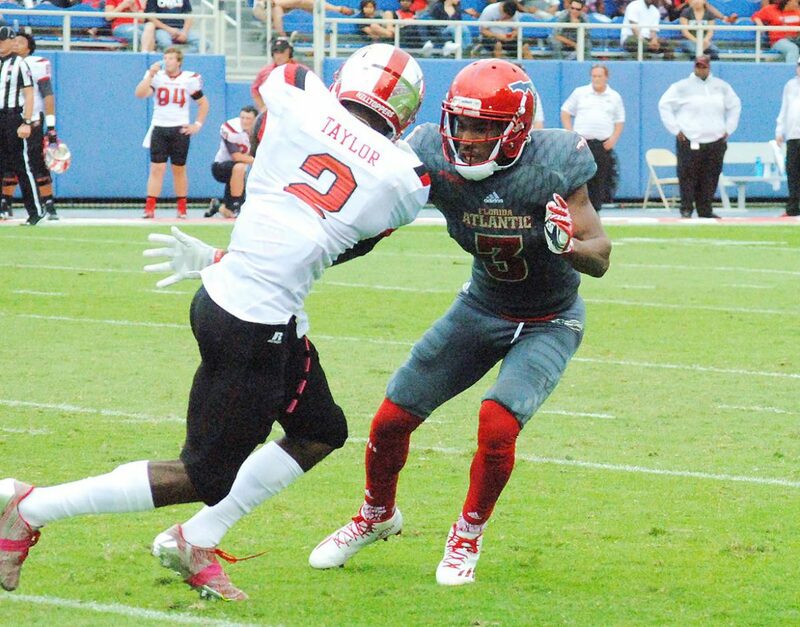 Wales is averaging 6.5 yards per carry, but his absence won’t cause FAU to alter its defensive game plan. “I don’t think it affects it at all because he’ll play the second half and the other running back (Quinton Baker) is a really good player. He’s a freshman but he’s pretty good,” Bellantoni said. 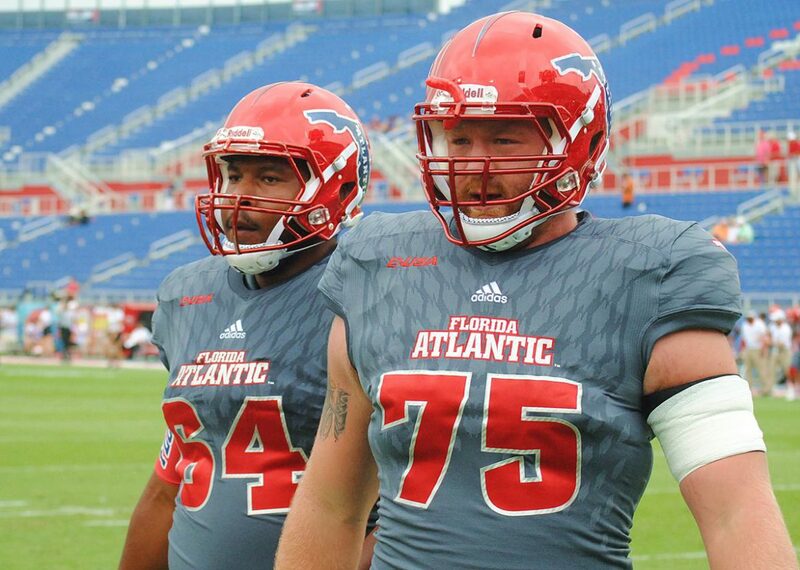 Going Deep: With the loss of offensive tackle Bryan Beck and injuries to Kelly Parfitt and Jakobi Smith, FAU is likely to give redshirt freshman guard Jack Breshears the first start of his career, and he’ll line up next to walk-on Matt Weiner on the right side of the line. Should any Saturday starters need to miss snaps, there is a serious lack of depth behind them. FAU’s official two deep lists Brandon Walton (questionable), Smith (questionable) and Fernandez (already a starter) as backups. They don’t even have anyone behind Weiner. 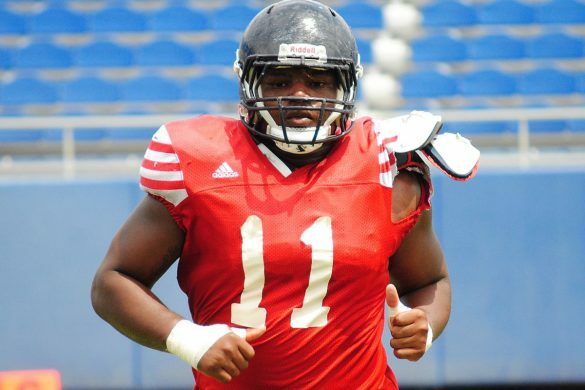 Some new names who could be called into their first game action should the Owls have to reshuffle: Richard Williams (center), Siffo Pierre (tackle or guard) and Chris Jones (tackle). 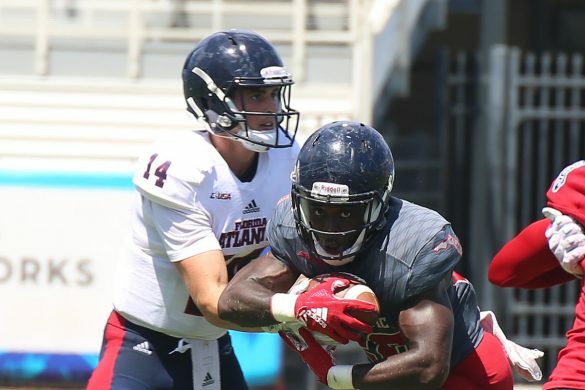 “With the five that we get out there that we start the game off with, those are going to be the five that we’re going to try to finish the game with, for once,” FAU offensive coordinator Travis Trickett said. 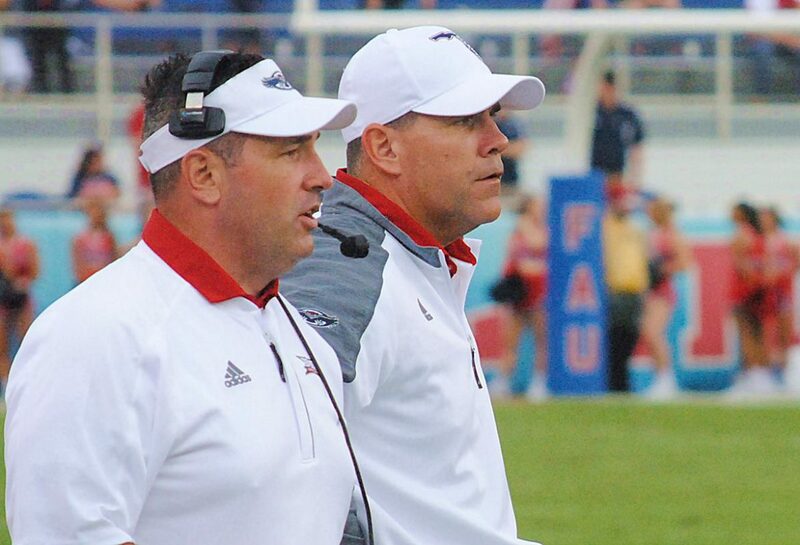 Boca Ties: A couple of WKU coaches will find extra meaning in this being FAU’s homecoming weekend. Hilltoppers coach Jeff Brohm was an assistant at FAU under Howard Schnellenberger, as was offensive line coach Dale Williams. 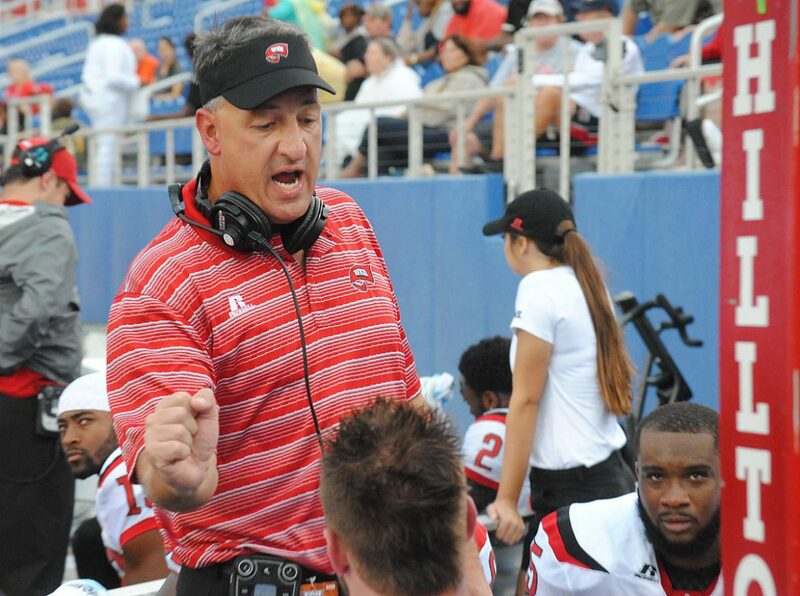 WKU QB White attended Davie-University High School, where he played under former FAU assistant coach Roger Harriott. 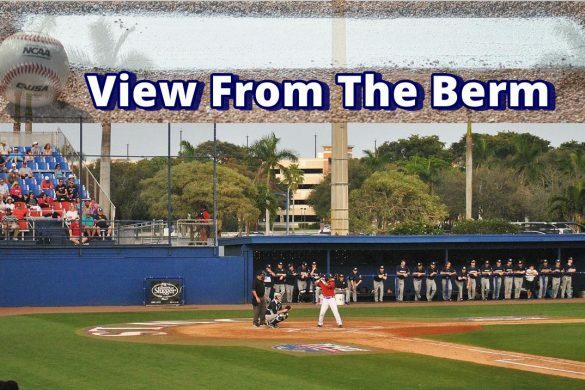 BOCA RATON – Throughout the course of FAU’s current six-game losing streak the Owls coaches consistently pointed at the team’s youth as a reason for their metronomic-like inconsistency. Nowhere has the inexperience been more evident than in the defensive backfield. 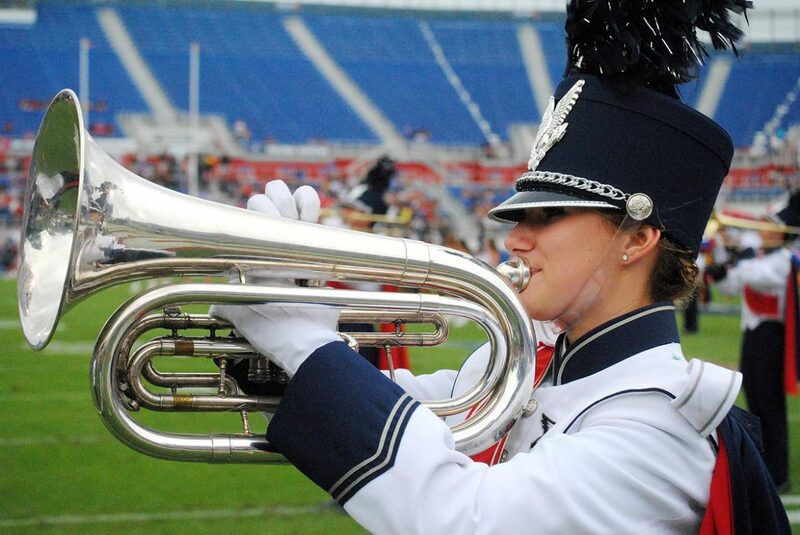 In recent weeks, however, that’s also where the Owls are seeing the biggest improvement. They will need to be much better on Saturday. 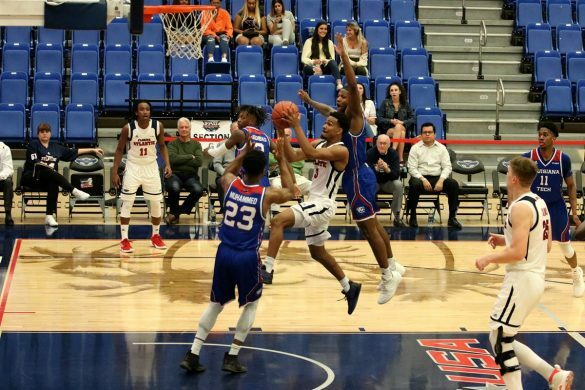 In both of their last two games the Owls held their opponents under 30 points – the only times that has happened all season. But Western Kentucky, Saturday’s opponent, is not Charlotte and Marshall. 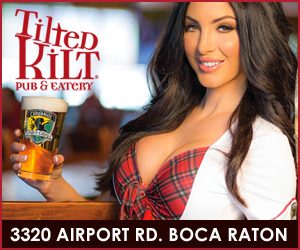 The Hilltoppers come to Boca Raton propelled by the No. 10-ranked passing offense in the nation. 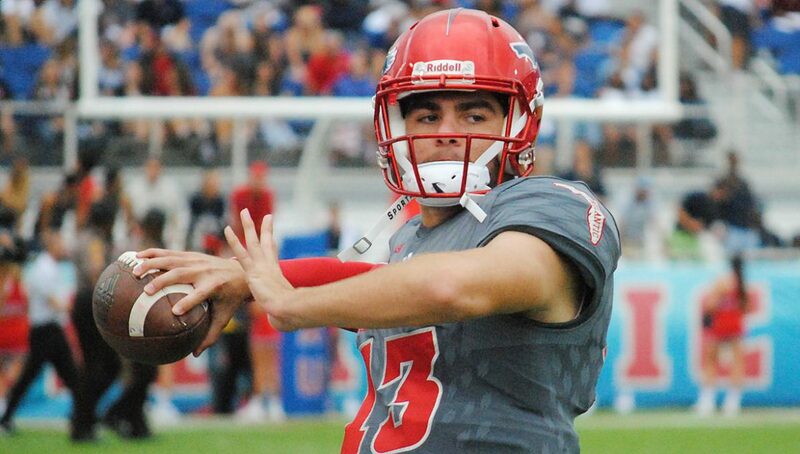 The 2,476 yards quarterback Mike White has thrown for is sixth-most in the nation, and he has tossed 14 touchdowns over the last four WKU games. To slow White the Owls will likely need a big game from Jalen Young, the quarterback of their secondary who’s enjoying a bit of a renaissance. 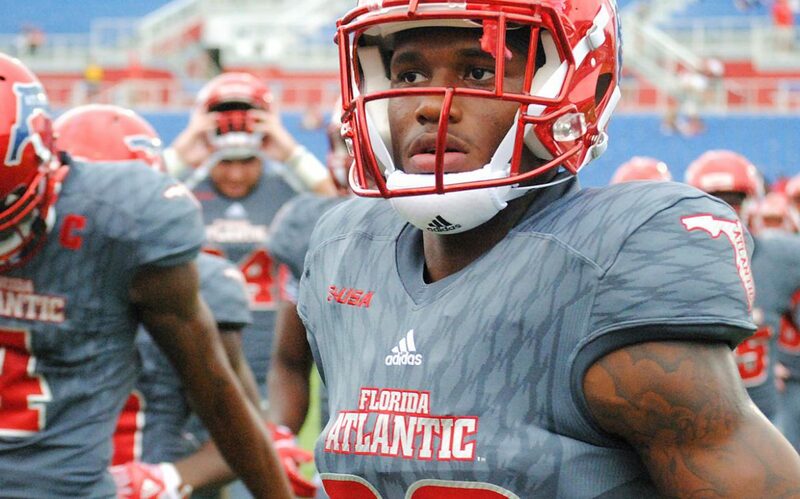 As a true freshman last season, Young emerged as a playmaker while leaning on FAU’s other starting safety, senior Sharrod Neasman, for guidance on and off the field. 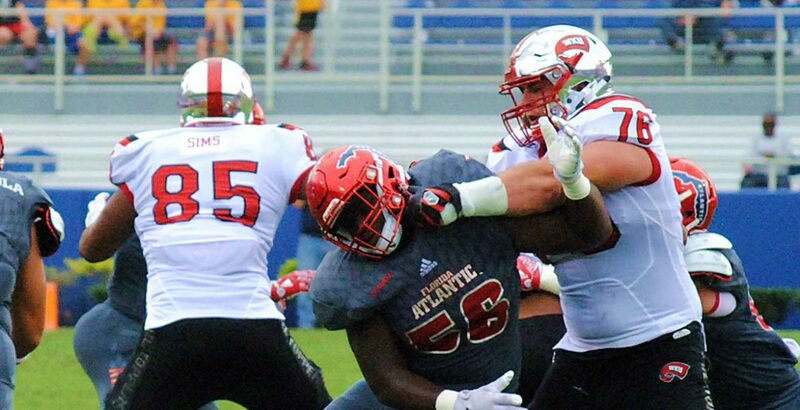 With Neasman now a member of the Atlanta Falcons, Young is the man in charge of the back line of the Owls’ defense. Early in the season he struggled with that role. Young’s 77 tackles this season are 18 more than any other Owl. Over the past four games he’s recorded 54 tackles, including 16 in the Owls’ most recent game at Marshall. The true sophomore also is tied with Andrew Soroh for the Owls’ interception lead with two. Young isn’t the only surging sophomore in the defensive backfield. Nickelback Ocie Rose played his best game of the season at Marshall. Rose recorded 41 tackles and scored three defensive touchdowns last season, but hasn’t been close to that kind of impact player this season. An ankle injury limited Rose’s ability to participate in fall camp and early season practices, slowing the sophomore’s development. 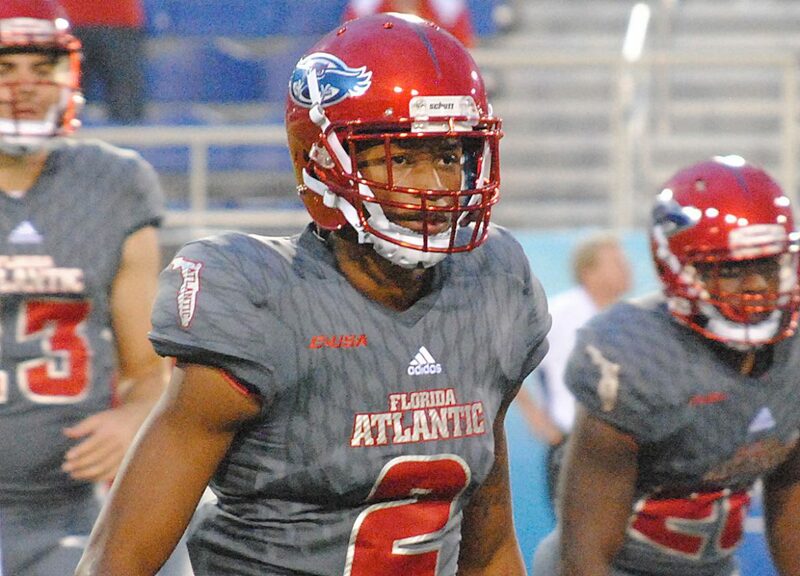 Counting Rose at nickel as the 12th defensive starter, FAU currently starts seven sophomores on defense. With cornerback Shelton Lewis and safety Andrew Soroh, four of them are in the secondary. Now that Young is coming on, the Owls are now looking for Soroh to pick up his play. In recent weeks opposing offenses have taken advantage of the first-year starter being out of position – most notably on Charlotte’s 37-yard touchdown pass in the closing seconds of the first half. 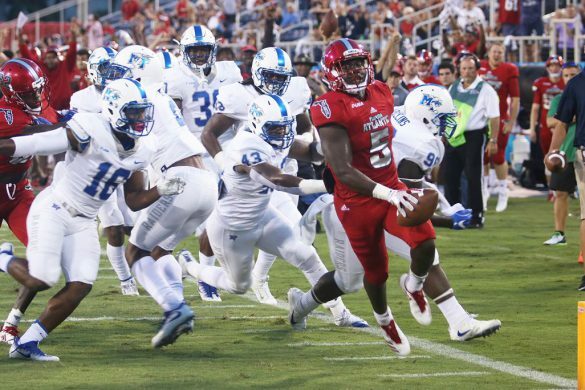 On Saturday the young Owls’ defense will have to overcome a serious experience gap between themselves and a WKU offense that has scored at least 50 points in three of the last four Hilltopper games. Kickoff at Howard Schnellenberger Field is scheduled for 3:30 p.m. 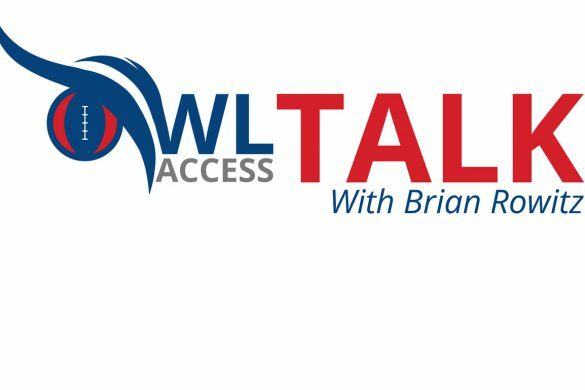 Welcome to the debut episode of Down With DeVivo, a weekly segment on OwlAccess.com where host Karla DeVivo profiles an FAU football player. 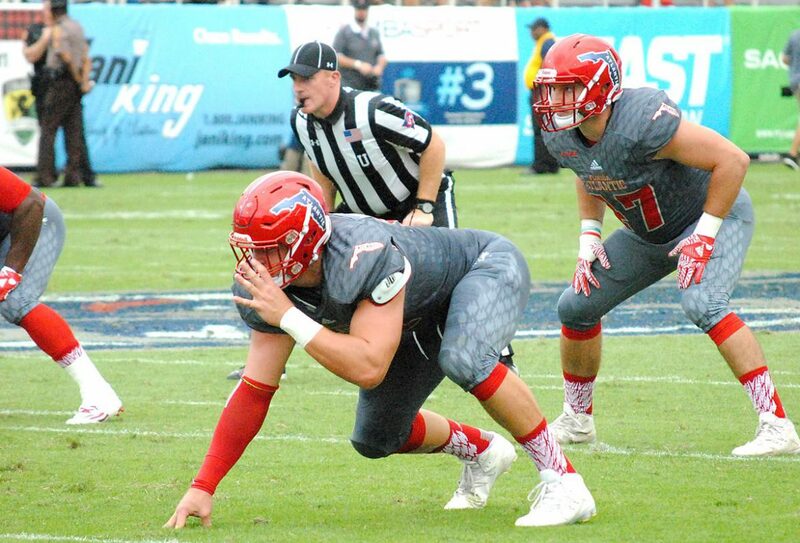 FAU defensive end Haiden Nagel joins DeVivo for the first episode. Nagel, a redshirt junior, was awarded with a scholarship prior to the season. 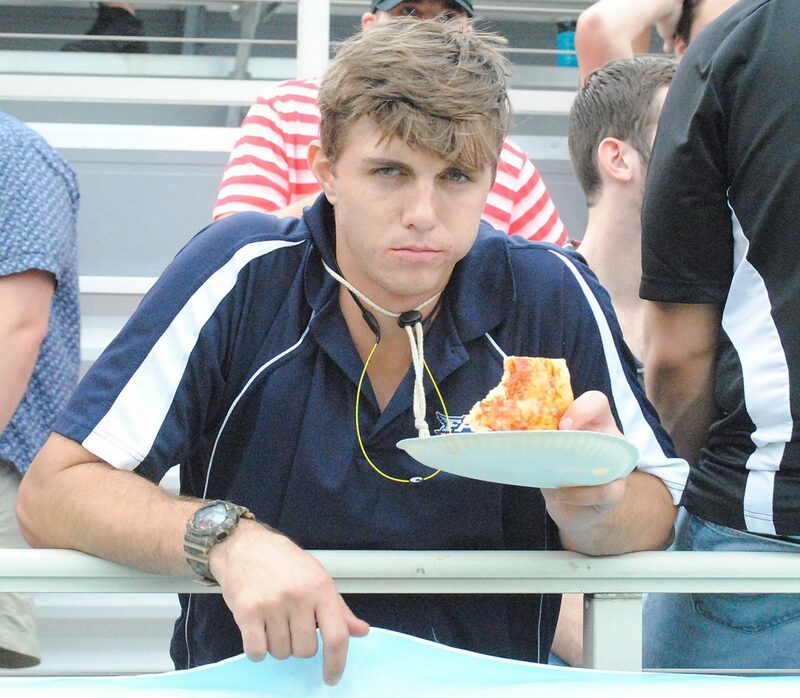 In Down With DeVivo, Nagel discusses his favorite football players, shows off his dance moves and talks about life as a member of the fraternity Delta Tau Delta. Through seven games this season Nagel has recorded 21 tackles, including one sack. 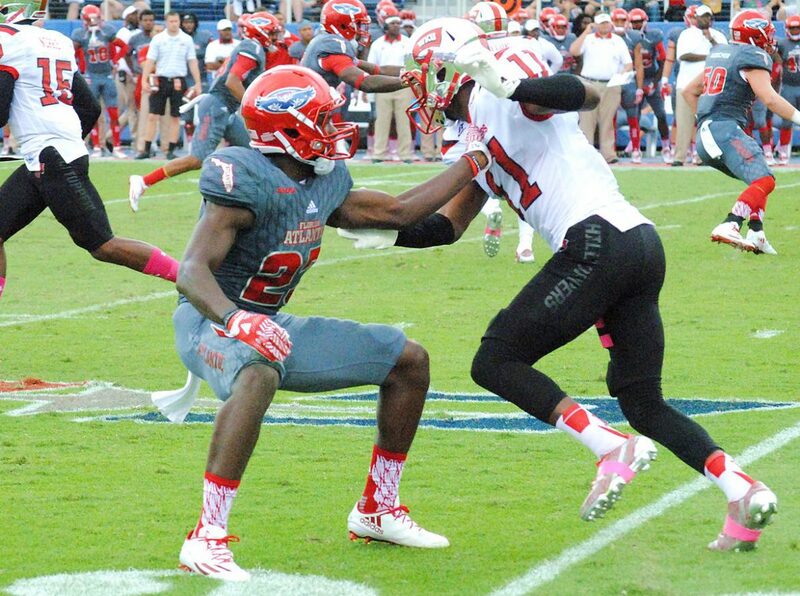 FAU plays Western Kentucky on Saturday. Kickoff at Howard Schnellenberger Field is scheduled for 3:30 p.m.